In 2017.02.04 I celebrated my 77th birthday on a cruise around the islands of Indonesia and then visited Singapore in 2017.02.15 for a days tour before flying back to Tokyo and San Francisco. I even got to see Mt. Fuji from the airport in Tokyo! One has to laugh as one looks through old pictures and newspaper clippings. We lived on a farm and I always thought we were in the middle of no-where! Then I see the local newspaper clipping and had a good laugh! 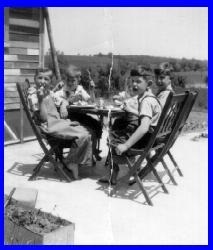 We had birthday parties and of course, our uncles and aunts were invited and they came to Pecatonica from Polo, Freeport and Brookville. And they attended dinner and brought presents for my sister and myself! Well that sure makes me wonder about how things got into the newspaper. Someone had written Feb. 3, 1946 on this clipping! 1947 ~ Famous on the Farm - The County Paper had Write Ups of Us! A second clipping I found is interesting also as it details a Sunday entertainment as a six PM dinner. We were on the farm so a six PM dinner seems strange to me! Our aunts and uncles were there, all Buntjers. Mr. & Mrs. Marvyn (Babe) Buntjer, Benny Buntjer and family, Faye, our father's sister and husband George Copoulus and another sister of our father's, Elizabeth and her husband Tony Agiou of Freeport! My sister and I were 'honorees' and received many gifts and wishes for many happy returns of the day! 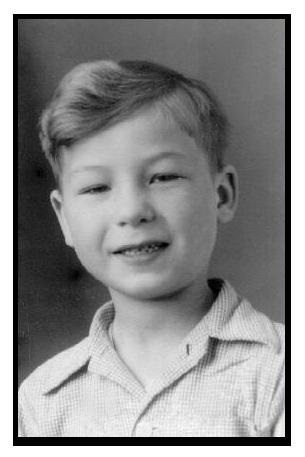 Here is a picture of me at seven years old! So I guess we weren't quite in the back waters of the farm land as I thought, especially since I was on the cover of Life Magazine in 1946, my 15 minutes of fame! 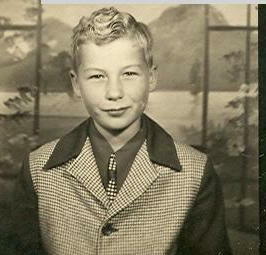 The photo on the left is when I was in second grade in 1947. I an on the left second row. Lots of curly blond hair then. 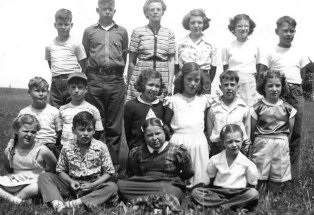 I attended the one room school until 1951 when we moved back near a small village called Brookville where I finished my eight grades in another one room school! 1947 ~ Cowboy Chuck and Cowgirl Yvonne ~ Outfits and Horse Back Riding! 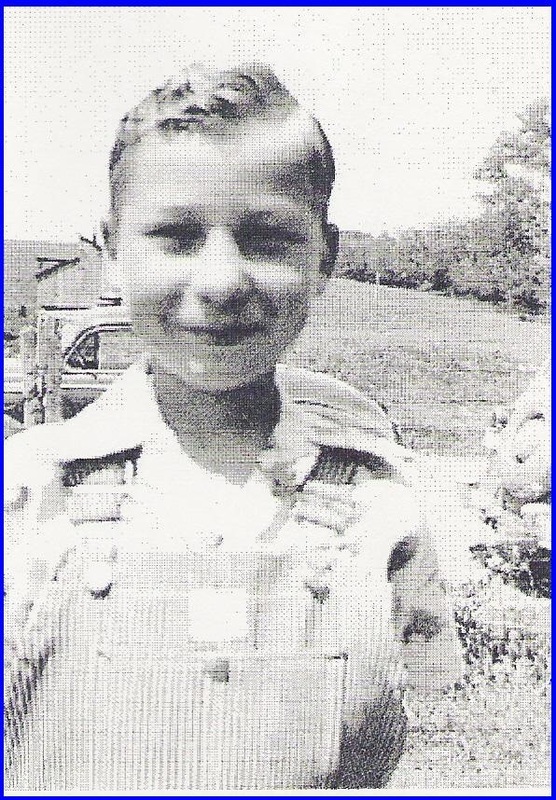 And here I am in 1947, with my cowboy outfit with the hat and of course, the six shooter! We used to ride our horses to Pecatonica and we rode in the opening rodeo's grand parade! I only did that once but it was fun as maybe a thousand sat in the grand stand as we circled and weaved our way around the fair grounds! My sister Yvonne, in her cowgirl outfit, was always riding and used to jump her horse and do the runs around the barrels and so on. Now isn't she cute! We had a trail ride on our farm once and a few days before I remember we did a ride around to select the best places to ride. I believe my sister lead the trail ride. Many times people would come from miles with horses in trailers and there would be food and so on for sale. Our farm was about 500 acres with a river running by it and an Indian mound on a high hill and 200 acres of forest. We had a great time riding and hiking all over the land looking for Indian relics and swimming in the river and so on. Huckleberry Finn I think! 1947 ~ Spring Floods - Fishing - Trains! Spring Floods and Fishing and Trains! Almost every spring, the river in the low lands of our farm, flooded. 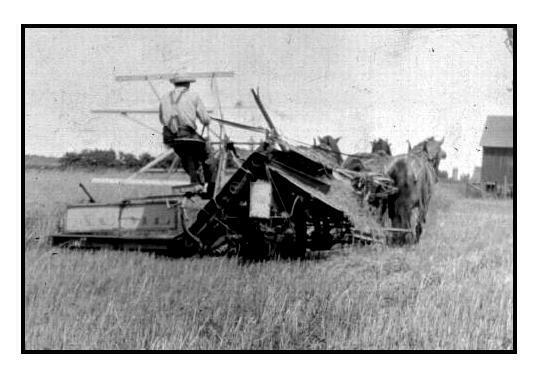 It covered all most of the farming area and then the land had fresh black soil, great for growing corn, oats, alfalfa and other things such as soybeans. Our house and barn were on the top of a hill so we could look down on the waters. I remember some nights with a full moon, the entire bottom of the farm was covered with a bright silvery glow from the moon. I remember our neighbors and uncles and cousins would come to our farm after the river level had fallen back into it's banks. There would be huge lakes all over the low lands and as they dried out, the fish would be so numerous one could just walk into the water and catch the fish by hand. 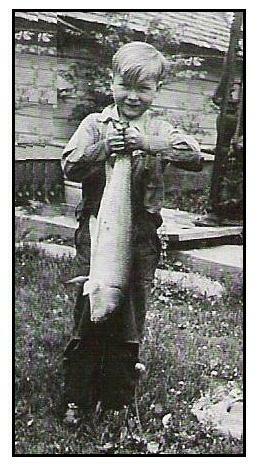 In this photo I am holding a carp. There were bullheads and other fish but as far as I was concerned, they were bottom feeders and not very tasty. Ever since then I have liked shell fish such as crab, lobster and especially the huge prawns or a light fish poached with butter and white wine. I remember standing in about two to three feet of water and fighting the fish as they were slippery and very wiggly! We caught gunny sacks of the fish and now I wonder what people did with all these dead fish. I also remember in the spring when the rivers over flowed, sometimes the super express trains from Chicago to San Francisco and Los Angeles would come by. The tracks were very old and not too stable for such big passenger trains and they would hardly move as they watched to make sure the tracks were still in one piece. One night we saw lights and then the Pullman cars and some had the glass dome on the tops for viewing. I was impressed and wondered if I would ever be lucky enough to ever ride such a train, let alone every see some place like Los Angeles and Hollywood! My sister said one train was called the City of San Francisco and the other the City of Los Angeles. My sister said wasn't it funny that now I live in San Francisco and go to LA many times a year! All this from 60 years ago! 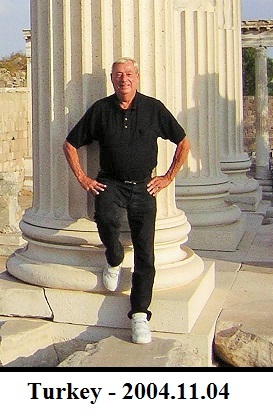 Well look at me now, living in San Francisco for over 43 years as of February 2006, just back from Beverly Hills besides traveling all over the world, such as this trip in 2006, to South Africa. Farm boy makes good! 1948 ~ Family Reunions on Both Sides of the Families - We had such Great Times! I remember all the great family reunions we always had each summer. Everyone would come and sometimes the reunions would be at our grandparents houses or later in Freeport at the big park. Everyone brought food and all we did was eat and relax, except of course, the children. We had too much energy just to sit around and I do know some aunts were grumpy and thought we should be seen and not heard! Well of course that didn't last long. Also, we children had to sit at our own table so as to not disturb the grown ups! Excuse us! Well, we would have been bored sitting there listening to them talk! So here I am with the Peterson boys at our own special table! This was at our grandparents Petersons near Pearl City Illinois! 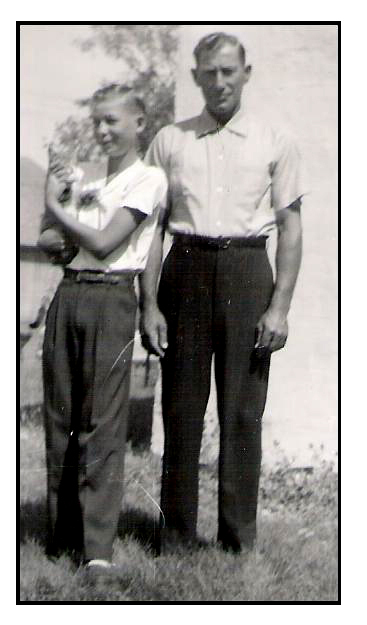 My uncle and aunt Johnny & Vera and their eventual seven children lived down the road from my Grandparents Petersons. My sister found the picture of me on the right that she never knew she had! I of course, an out in the fields helping with what ever type o f grain was being grown. I certainly had a big nose then. Thank goodness it has gotten smaller or my head has gotten bigger! My sister told me she had kept this photo of me in her billfold for over 50 years and I didn't know about it! She said she really loves it! Such a nice sister! It was taken in 1949 at the Sauerkraut Festival in Forreston Illinois. Every year the little town had a festival and all the German and other nationalities would come to the town for a weekend of Sauerkraut and sausages. A carnival would also come to town with rides and side shows so we all had a great time. My sister thinks this photo was taken in one of those photo booths and I wonder where my mother every bought the outfit I was wearing! Snazzy for a farm boy in Illinois. My mother was very smart and artistic even though she only went to school for a few years and then had to work at home. If I remember correctly, sometime in the 1960s or so, the festival suddenly was smaller and finally disappeared from view. That is too bad as almost all of these types of happenings have disappeared from the local landscape! 1949 ~ The Original House near Polo Before Being Remodeled! 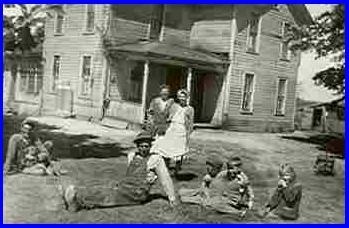 This picture taken around 1949 is the Buntjer family in front of our house on the farm that we owned near Brookville and before we did a major remodeling job on the house and build a new barn and machine shed. We had all the latest in house wares, beautiful kitchen and bathroom with all the latest fixtures. This was a lot different than when I was small and had to use the 'out' house! Especially bad in the middle of the winter at night! 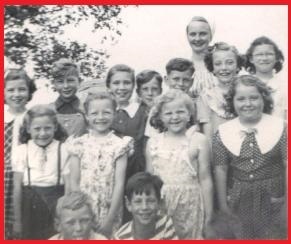 1950 ~ Summer Picnic at the Wagner One Room School! This picture taken at our summer picnic at the Wagner one room school. I was in fourth grade but we moved that year back to Polo where we owned a 160 acre farm by a little village called Brookville. We also had been renting a 500 acre farm near Pecatonica Illinois to help rebuild the house near Polo plus a new barn and machine shed and oats bin. In 2010 I got a message on Facebook from Sandi Lender who appears in this photo on the first row, right. She also sent me a photo that I also had, when she was in first grade and I was in second grade. I am in the left back row with Carol Neuberger! Sandi and I can only figure out five people in the photo! We have been trading many stories about attending a one room school and she said she and several others from the school still had my Life cover and the photos inside! 1951 ~ Our New House Near Polo Illionois! This is how the house looked after we remodeled it in the early 1950s. This picture was taken in 2004 on my sister and my mid-west tour of Illinois, Iowa and Missouri. We drove to Polo and then to Brookville to see the farm. We were pleasantly surprised to see the entire farm almost the same as it was 50 years ago! Even many of the large trees are still there! The house has been taken care of remarkable well considering how many farms around were left to fall apart or were torn down to build newer ranch house style homes. 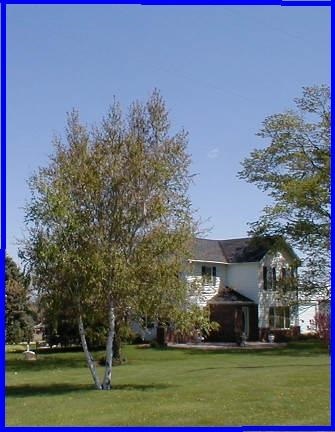 Check out this link for bigger photos that shows the house in 1949, 1951, and also a photo taken of my cousins and my sister and myself in May of 2004! 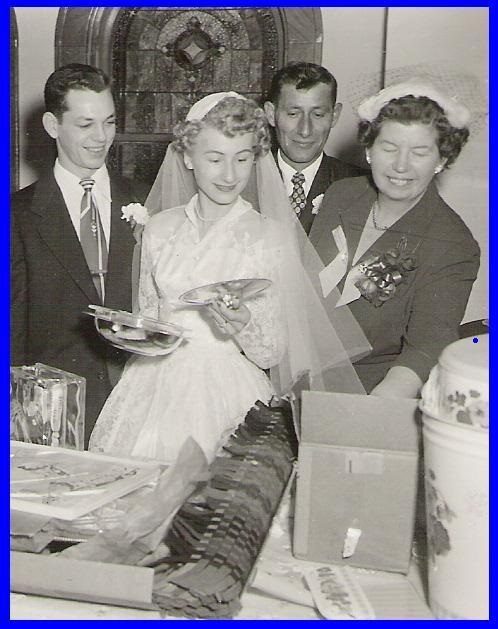 1952 ~ My Sister Yvonne and Her Fabulous Wedding! This was a big occasion as my sister was getting married to Kenneth Burt in November. A beautiful wedding was held at the Brookville Church with candle stands all along the windows of the church and by the alter. My cousin Randall Peterson and I were the candle lighters and were dressed in tuxedoes. (I was told in a Protestant Church, the person lighting the candles is commonly called the acolyte - how is that for trivia!) 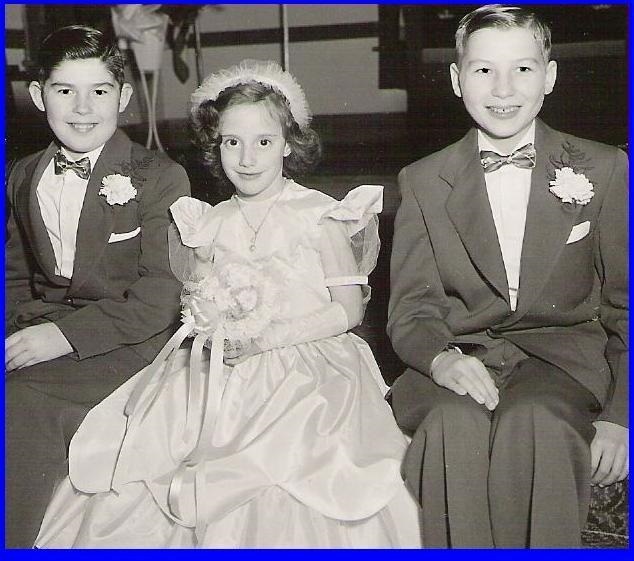 My cousin Nancy Copoulos was the flower girl and my sister had the most beautiful wedding gown. It was a fantastic time and we all seemed to enjoy the occasion. After wards there was a grand set down dinner for guests! So here on the left is Randall, Nancy, and myself looking dashing for the wedding! 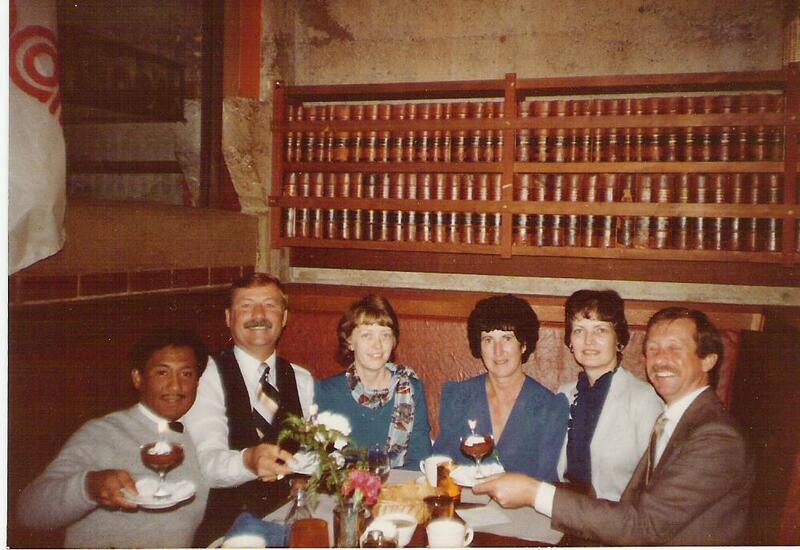 And of course, on the right, Ken, Yvonne, and our parents, Walter and Edna Buntjer! 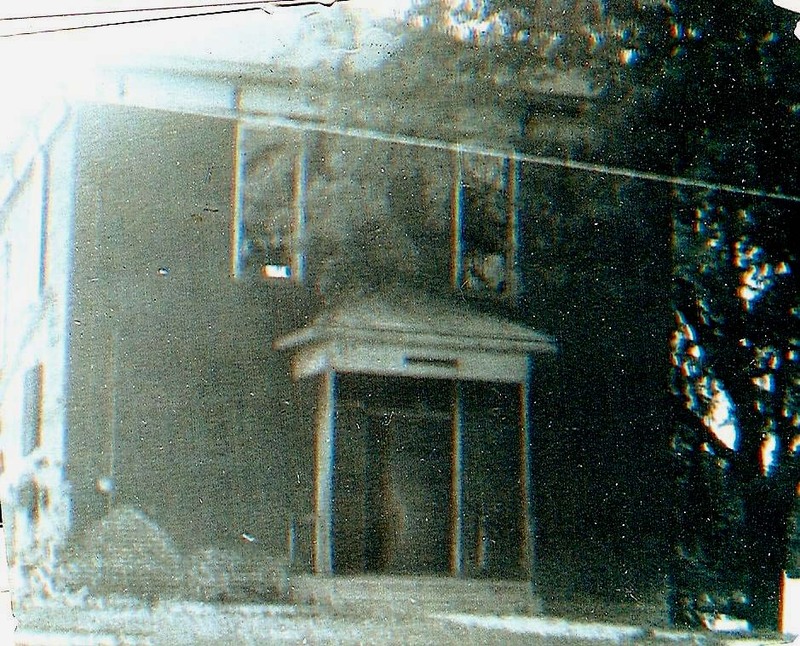 1954 ~ Another One Room School in Brookville! I went to another one room school after my stint in a one room school house in Pecatonica and the cover of Life Magazine. This was in a small village named Brookville. I have been talking with Sharon, a student there with me and she is doing research on the one room school but there isn't much information for the village. My sister was married in the beautiful small white church on the edge of town. She and I took a car trip in 2004 from Chicago to St. Louis and drove through Polo and then into Brookville. Well the school-house was gone and so was most of the little village. A few run down houses and broken down cars were in the yards. A school mate of mine, Sharon Smith, is doing research to see if anyone has photos of the school or the students. 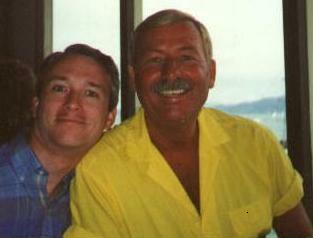 This is the only photo I have been able to find of my father, Walter, and myself. It was taken a year after my mother passed away with breast cancer, a horrible time for me as I felt alone and adrift. You can read about my staying at a woman's house in Brookville while I finished grade school there before going to Polo High School. 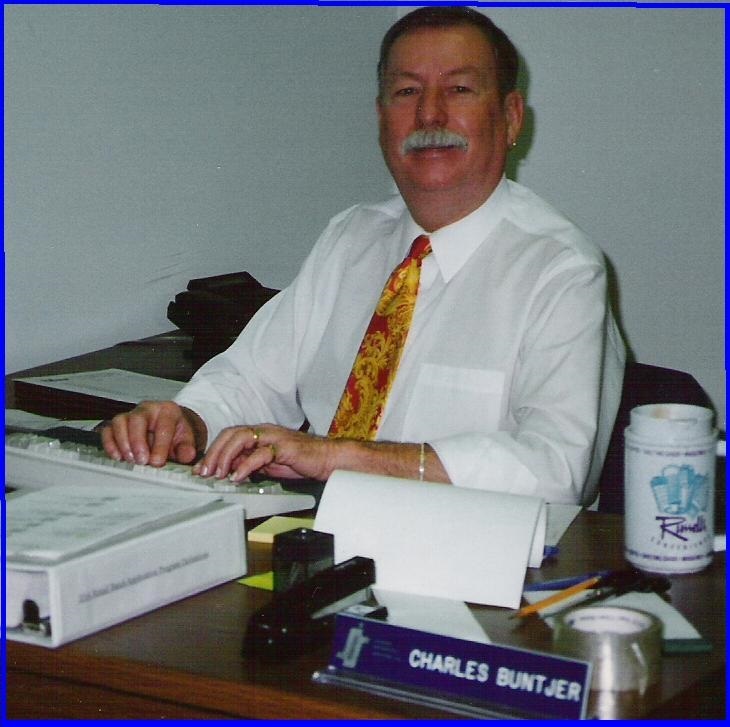 It is interesting I still sign my signature as Charles W. Buntjer! It seems very strange we didn't have many photos taken but then, I don't have any with my mother either - just the one when I was a baby. We are spoiled with our digital cameras today. Instant gratification! As you can see, we both were very trim from working on the farm. I tired to drink milkshakes and so on for years to bulk up. Even in the army I was trim due to marching miles at a time. 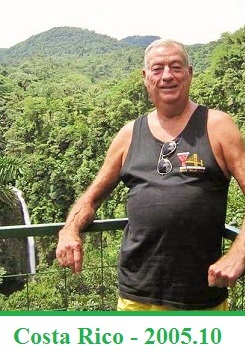 Of course, when I turned 55, suddenly everything went to my waist. So goes life! Can you believe in 10.29.2009 I was looking in my jewelry box containing my cuff links, tie tacks, rings and so on. I noticed behind the backing was a paper and I wondered what it was. What a surprise! Can you believe after 55 years I saw a certificate stating I was enrolled in the Polo Community High School. Now I wonder how it got there! Here I am with the Polo Junior class. My sister found this photo in a box and we aren't sure where it came from. 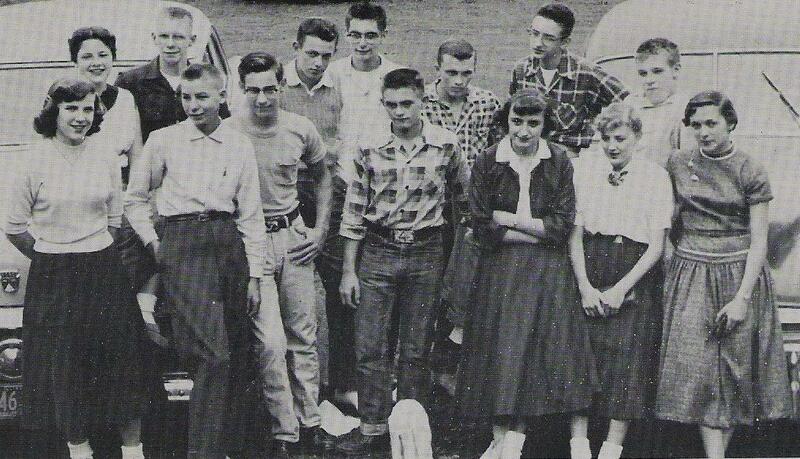 Sharon Miller sent me the names of the students in the photo from 1958. She has been in touch with me since our 50th High-School reunion. She and I also went to a one room school-house in Brookville Illinois. I had to laugh, I left Pecatonica and the one room school-house and moved back to Polo where I was born on a farm and ended up at another one room school-house in the village of Brookville. Here I am graduating from Polo High School looking rather pale and young at 18. My high school days were busy as I had a car and was able to go and do what ever I wanted to with a little help from my father's gas tank on the farm! I wonder how many tanks of gas I went through dating and going roller skating at the White Pines National Park, the drive in movies, dancing, and just plain goofing around! 1959 ~ A New 1959 Two Door Hardtop Buick! Here is my first brand new automobile - A two door hard top Buick! I still haven't figured it out after 50 years, as to why my father decided I needed a new car and he suggested a Buick. I was shocked as I loved the new 1959 Buick hardtop with the huge windows and the speedometer that had a red line to display the speed rather then a needle as even today in 2010, most have. And this is the color of my car, a spiffy green with a white roof. I wonder if my father thought the Buick would make me perhaps, want to stay on the farm! When I was drafted in 1963, after being stationed at the Presidio of San Francisco, I drove the car out here from Illinois and drove it for about five years before I let it go and ended up with a British Motors Spitfire two door convertible from a friend of mine. He was moving to Manhattan in 1968 and asked me if I would like to have the sports car for free! Of course I said. 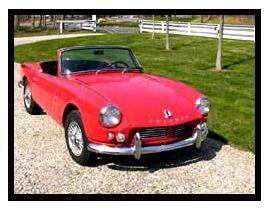 I loved that car and drove all over the Bay Area with the top down most of the time. Certainly a different life style, riding a horse or tractor in Illinois and a few years later driving a European sports car around San Francisco! 1960 ~ First Jobs in the World of Computers in Illinois! 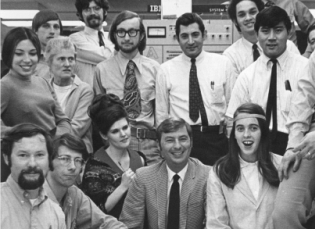 My first job was at Burgess Battery in Freeport where I was sent to Chicago to learn how to wire boards to program 402 and 403 IBM machines at the age of 20. I then worked for Anderson Brothers, Ingersoll, and Amrock in Rockford before the Cuban Missile crisis changed my life. At this time I also decided I needed to work on my inter-personal skills so I went to Arthur Murray's Dance Studio of all places to learn how to dance. They offered me a job to work in the evening and I decided, why not. I would get paid to learn how to dance and also I could make some extra money on the side. Plus we had great parties after work and sometime we gave dance exhibitions around the area. Not too bad for a farm boy, working in computers during the day and dancing my feet off at night and only 22 years old! 1961 ~ Dating in the Midwest Before the Army Called Me Up! I was dating a very nice woman while living in Rockford Illinois. I originally was dating her and then dropped her for another girl, Pat. There were four of us and we all had a great time together double dating. The other woman, Pat, was very beautiful and she wanted to become a model in Chicago or New York. 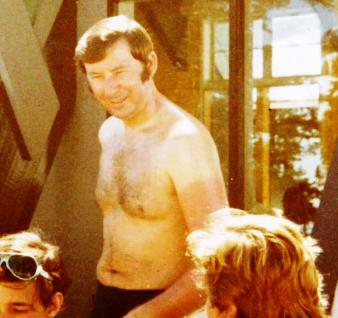 We used to go out dancing two or more nights a week at the local cocktail bars, very sophisticated for Rockford. We went for years and we were underage. Interestingly, on my 21st birthday, the manager of the cocktail lounge had a good laugh, said he had never checked our I.D. and if the police ever came in he probably should have checked us out. Well he had a good laugh, my birthday, number 21, was the next day so we had to leave until the next day! When I was dating Susan she was in college for a while in Wisconsin and I went a few times to her annual college dances and we had great times. In this photo, we went to a Halloween party in Rockford. 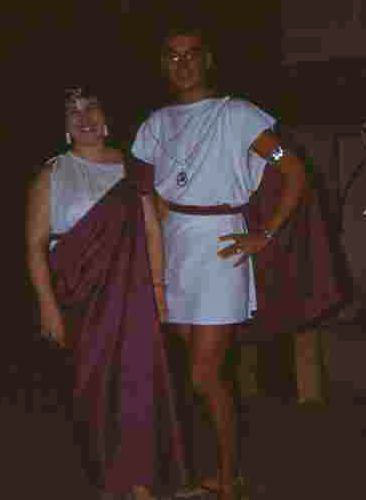 We were suppose to be Roman and my sister made up the outfits plus I had glitter on my eye lids, not too Roman, I think more Egyptian! Years later I learned that Susan had gotten married and had a baby but then had cancer and passed away in her 30s. So sad. And my hot date, Pat, got mad at me for not wanting to get married and told me off. She got married to the hot motorcycle number in town and I was drafted in the Army during the Cuban Missile crisis! I found out later she had a baby and her 'hot' husband used to beat her. Well imagine my surprise when I got a letter delivered to me at the Army post in San Francisco at the computer center where I was the manager. The guys of course, were interested. I opened it up and read the following.... I miss you Chuck and my daughter and I would love to come and visit you in San Francisco. I guess the other 'men' knew something was up and asked to read the letter. They had a good laugh and I ripped up the letter and dumped it into the waste basket. Sorry.... No Chuck here or a second-hand Daddy! Pan Am was the first airline to operate the 707; the aircraft's first commercial flight was from New Yor k to Paris on 26 October 1958. American Airlines operated the first domestic 707 flight on 25 January 1959. Airlines which had only ordered the DC-8, such as United, Delta and Eastern, were left jetless for months and lost market share on transcontinental flights. The 707 quickly became the most popular jetliner of its time. Its popularity led to rapid developments in airport terminals, runways, airline catering , baggage handling, reservations systems and other air transport infrastructure. The advent of the 707 also led to the upgrading of air traffic control systems to prevent interference with military jet operations. After I got to Miami and spent a few days enjoying the hotel on the beach I flew for my second plane ride, a one engine pusher propeller sea plane. Exciting to fly in as there had been a hurricane and the waves were very dangerous. 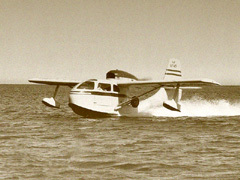 We didn't think we were going to make it from the ocean to the shore on the island o f Bimini. We did make it but it was hair raising! Then off on the Bahamas cruise! So for my third airplane ride, when we got back from the cruise and landed in Miami, our Pan Am 707 flight was canceled and we were asked to fly one of the new turbo jets, an Electra (plane on the right), that had many crashes. This flight was going to New York and almost the entire passengers said no way will we fly on that plane. So they put us on a four engine propeller plane to Cleveland and on to Chicago and was I surprised. After the first ride on a jet passenger plane, the prop engines chugged along and the plane vibrated and was not very enjoyable as the jet but, with in three weeks I had flown on three very different types of planes. I did eventually ride an Electra when I got out of the Army boot camp in Fort Knox Kentucky and flew back to Chicago before flying United to San Francisco in 1963. After that I regularly flew United 707s back and forth from San Francisco to Chicago to visit my father near Polo and my sister in Rockford Illinois. I n 1967 I flew back to Rockford Illinois where my sister was living. Rockford is the second largest city in Illinois (at least at that time), and when I landed in Chicago decided to take a plane into the Rockford airport instead of a bus or having someone drive all the way to the airport to pick me up. Little did I realize I would be riding in a pre-World War ll DC-3. Talk about a bumpy ride, so low to the ground. 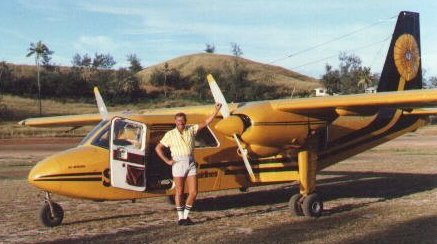 Then in 1982 I finally flew in a one engine propeller plane flying from a secluded island to the main town of Suva in Fiji! I had the jump seat next to the pilot so got to see the islands and reefs as we flew into the Suva airport. 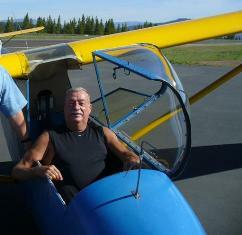 And finally in 2008 I flew a glider over Lake Tahoe in Nevada. That was a great thrill and now I only haven't flown in a helicopter for some reason. I almost did in Hawaii and in Zambia Africa over the Victory Falls but both times I was too cheap to spend the money to fly in the helicopter. 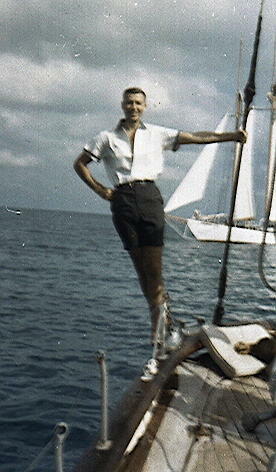 1961 ~ My first big trip - Carribean Cruise on the Wind Jammer! It is hard to believe that in 2006 my sister found this photo 45 years after I took this trip to the Bahamas ! She called me up and said she had been unloading boxes of things she has been keeping for over 50 years or so and scanning photos and throwing out things no one would want or even know about any more. I told her I remembered very clearly I was excited about my first trip in 1961and went to a camera stop in Rockford Illinois where she lived and I was working. So I found a camera I liked and bought it and took it on my trip to the Caribbean! Check out the Bahamas link on my Home Page for a full blown description of my first big trip of my life! I remember about half way through the trip, suddenly the camera wouldn't load the film and the shutter wasn't working correctly. Well of course I was mad and I think I managed to rewind the film or I took it back to the camera shop. So I figured there weren't any photos in existence from my first big trip in my life. Low and behold, my sister found in the bottom of a box, a negative of me on the Windjammer Cruise! Not a photo but a negative all by it's self! Strange! She said she just put the negative on her scanner and low and behold, presto, a not too bad copy of me at 21, hanging onto the rope of the ship as we sailed from Bimini to the rest of the islands in the Bahamas and almost to Cuba! Actually that is pretty funny, in 1961 I almost landed in Cuba and in 1963 I was drafted because of Castro and Cuba and ended up as the top sharp shooter (rifleman) of the battalion and a chance to go to Officer's Training to be a Second Lieutenant! I didn't think so, not with computer training under my belt! I was very lucky and ended up in San Francisco in a plum job at the Presidio managing the swing shift in the computer center under the Golden Gate Bridge for only two years and then off to the corporate world and eventually consulting at all the major companies in the Bay Area! 1963 ~ A Very Big Surprise - Drafted! 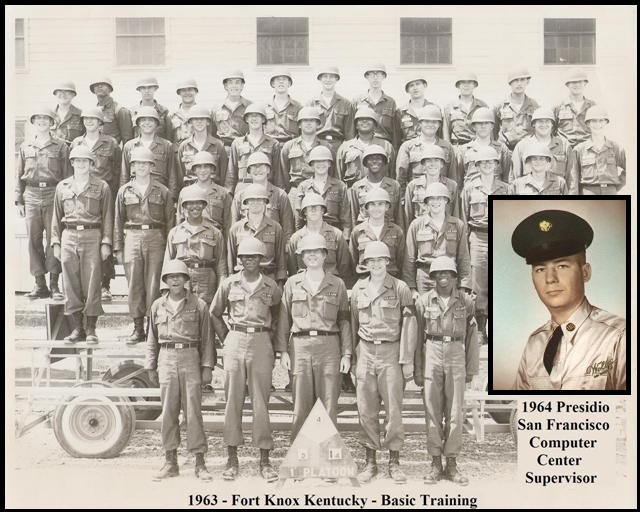 I had several jobs in Rockford before being drafted in 1963 during the Cuban Missile crisis and ended up as the swing shift supervisor at the Presidio Army Base in San Francisco. I was sitting in a bar after working an eight hour day at a company in Rockford Illinois called Amrock. This was an up and coming business with the latest computer equipment. I remember even then, they had the latest disk storage memory in the country. It was the size of a large refrigerator and had about 12 huge magnetic disks. There were 12 read/write arms, one for each disk. So when a record was read, the entire system of arms slid back and forth to find the data to read or write! So with my training in computer systems, I was lucky enough to be the swing shift supervisor at the Presidio, over looking the Golden Gate Bridge and my barracks over looked down town San Francisco! Most of the other men in basic training. (Fort Knox Kentucky), ended up in places such as Fort Benning Georgia, not a very nice place for training. I was the top shot in basic training and received a medal for being a sharp shooter! Due to my high IQ and computer ability, I was asked to go into officer's training but decided I was better off as a civilian and working in the open market rather than living a regimented life that I would find hard to follow. I also found my Army Discharge Papers and was surprised to see in 1969, they still had my address as RR 2 Polo Illinois! They indicated I had completed all my service requirements and was officially discharged. I don't know what they ment by fulfilling my requirments but someone told me perhaps I should have done some summer military exercises. Huh I said. Well what ever happened, I was happy living in San Francisco and working in the biggest computer center west of Chicago at Fireman's Fund Insurance! 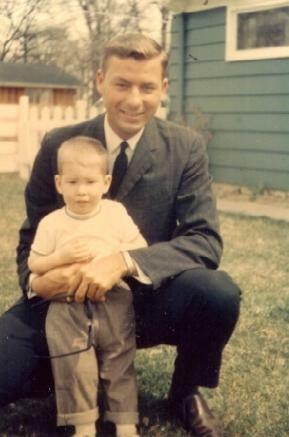 1965 ~ Visiting my Sister in Rockford after the Army - Ready to live in San Francisco! I was just about to get out of the Army at the Presidio of San Francisco and decided to visit my sister, brother-in-law and my nephew, Bill. As you can see, he was still very small and when he was older I told him I used to change his diaper. This went over big and my sister had a good laugh about that! I decided when I got out of the Army, I would never live any place else but California and San Francisco unless it was Paris or Venice. Well so far after 45 years as of 2008, I am still living the good live in San Francisco and California. I have never missed the mid-west or wanted to move to another state. It is a state of mind! This photo was taken in 1965 in the yard of my sister's house in Rockford Illinois. 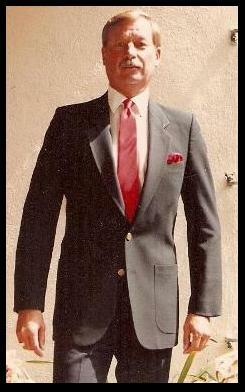 1966 ~ After the Army I started to work at Fireman's Fund - 18 Years! 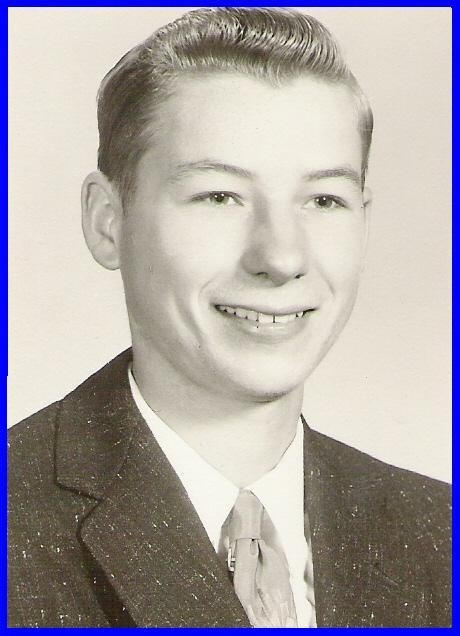 (See the photo of me at Fireman's Fund Insurance - 1969). and finally Franklin Templeton in 2002. 1967 ~ DC 3 - Flying from Chicago to Rockford Illinois! My father became ill this year and I flew back to Rockford Illinois where my sister lived. Rockford is about 85 miles northwest of Chicago. I flew many times on United to and from San Francisco and Chicago while in the Army and afterwards. After many years my sister lived in a suburb of Chicago but when she was in Rockford, I flew to Chicago and then flew to Rockford on a DC-3 airliner. Talk about some ride! During the 1960s I flew on Boeing 707s so were used to the big jets. Imagine my surprise when I went from the United 707 to board the local airliner to Rockford! It was a DC-3 and had a small aisle and one seat on each side of the aisle. The seats were very small and hard. There were large windows by each seat but there wasn't a door to shut between the pilot and co-pilot and the cabin. After we took off the stewardess asked me if I wanted a cup of coffee and if I wanted cream or black. I said black and watched her go to get it. She went to the front of the plane and dug around under the first seat. There were two thermos bottles and she poured me a coffee and brought it back. I looked out the window and we were flying so low I thought I could see the leaves on the Oak trees! Then I looked across the aisle and saw a man in a suit looking very pale and secretive. The next thing he reached inside his coat and took out a bottle of whisky and took a big slug! He continued this the entire time we flew to Rockford. I can't remember but the trip probably only lasted a little over an hour in the air. So this was the only time I flew on a DC-3 but it was quite an experience. Another one for the books! Of course since then I have flown on aircraft around the world on my travels but this one remains one of the more interesting! 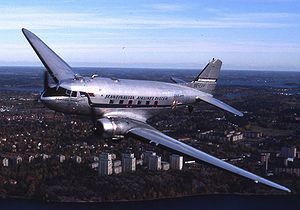 A total of 10,655 DC-3s were built at Santa Monica, California, Long Beach, California and Oklahoma City in both civil (607) and military (10,048) versions. 4937 were built in Russia. A total of 487 were built in Japan. The overall total produced was 16,079. More than 400 remained in commercial service in 1998. 1968 ~ Party Time in the City - Flower Children on Haight Street! During the 60s those of us lucky enough to be living in San Francisco, were in the middle of the Flower Children and Love and Peace movement. I was working at Fireman's Fund Insurance so I wore a suit to work. Then came Friday evening and we would be off to Haight Street. We would go to the clubs and meet people, dance and what ever all night, be invited to someone's apartment and the only furniture would be one bean bag chair, that was it! We would drink, smoke grass, dance, kiss and hug all night, from Friday until Sunday night! Then home and off to work for five days and then start the weekend all over again. We wore 'love' beads and bell bottoms along with long hair, well, not too long for the office, and thought we were the in crowd. So it was funny, during the week I was in a suit and swing shift supervisor, then on the weekend, Mr. Love Child! This was just the beginning of an era that is now long gone! 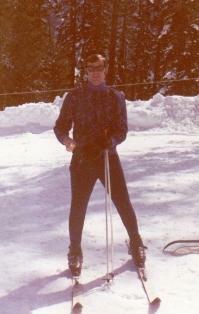 1969 ~ Chuck - The Novice Skiier! 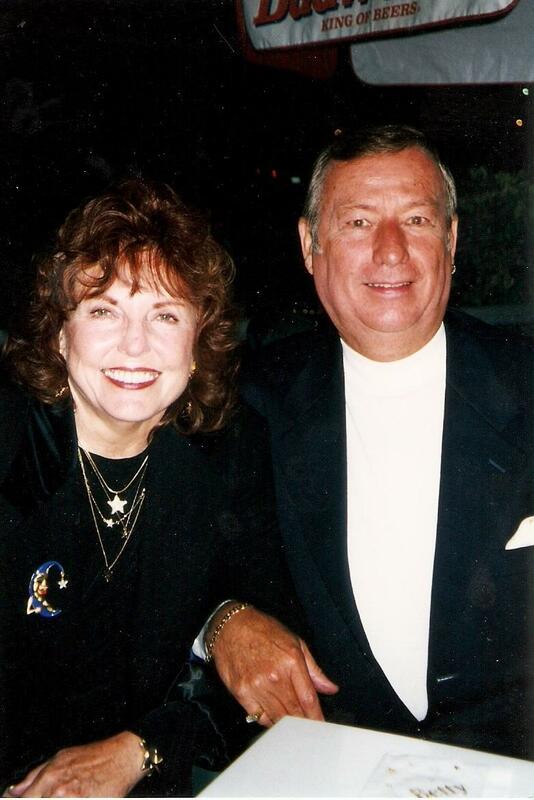 Patti Memoli and I met at Fireman's Fund Insurance Company in 1967. It was the largest computer center west of Chicago, state of the art at that time. She and I began a long friendship. Over the years we took tap dancing lessons, cooking classes and I took my famous skiing lesson at a ski resort near Patti's winter/summer house in Truckee. 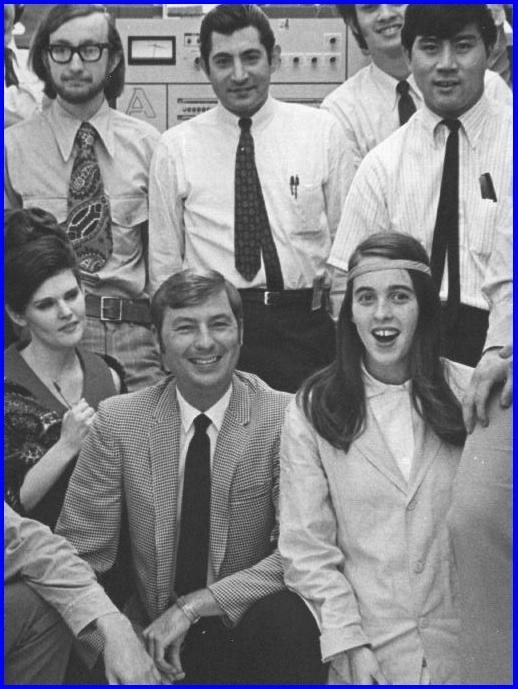 Patti started working at the Fund in June, 1967 (19 yrs old) making $74 per week as a Tape Certifier. I was a computer operator and I was making $95 a week! Here we are in 1969 at the swing shift at Fireman's Fund! Patti on the left of the photo and in the front row center with the spiffy jacket, me! I was a novice at skiing and she suggested I take a lesson, me take a lesson as I am so good at doing everything I put on my skis, went to the 'bunny' slope and there were about 15 people to take the class. I, of course, went to the top of the bunny slop e ahead of everyone. The instructor just looked at me and I gave him the look, like do I need a lesson? Well suddenly my skis started to slide and I turned sideways to stop and ended up sliding over everyone's ski tips and then proceeded to fall down. No one said anything but the looks, like you twit, running over the tips of our skis and then falling down. This from Patti: Mt. Lassen is where you had your famous 1st lesson. There was only a rope tow, no chair lift and you had to stop before the bottom of the bunny slope. Why? Because over the bump at the bottom were the hot springs. If you missed stopping, you would get wet. We saw several beginning skiers do this and always thought it was hysterical. From then on I was quiet and followed instructions, especially how to stop or fall down if needed correctly. At the Mt. Lassen Motel, our rooms had 2 doubles, You would always take one and loudly announce "I am not sharing this bed", leaving me to crash with whomever had come with us. Never a fun thing for me. The rooms were 1950's tacky with knotty pine walls and orange shag carpets. In the winter of '69-'70, we had our famous Swing Shift Ski Trip. That is picture of you and I in front of Dave's car (married, brought wife and kids - I have a couple more pictures of the gang). Well I just got in 2011 several photos from Dave and here I am sunbathing at Mt. Lassen. He also had a photo of many of us from the computer installation at Fireman's Fund on a fun weekend - ah, the good old days! 1973 ~ Patti and Chuck - Skiing Adventures! Patti and I had lots of fun during our skiing adventures. 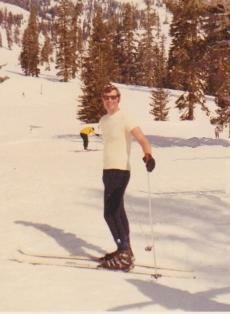 Here I am in 1973 looking like I know what I am doing at Squaw Valley. One Friday afternoon we packed up the car and off to Truckee and her house to have cocktails, sit by the fire, tell stories and just have a good time away from the computer center and all the trials and tribulations we encountered there. We were on the freeway after a few hours and suddenly there was a mass of cars and we were told the freeway to Tahoe was closed due to snow but we could go as soon as the snow ploughs opened up the roads. So in the middle of the freeway, we opened a bottle of wine and relaxed. We got almost to her house and the snow was two feet deep and we had to put chains on the car to make it the rest of the way. The freeway was a mess. We got to the house and Patti had a fit. A man down the road was suppose to clear off the flat roof of the house when too much snow got onto it. There must have been three feet on it. We had taken another 'friend' with us and she put the two of us onto the top of the roof at three a.m. and told us to 'shovel' or else. We got so hot we took our shirts off. Then we finished and came down and proceeded to have cocktails. If I remember correctly, Patti went to change for bed and I ripped off my clothes and into the big bed - perhaps passed out from the snow shoveling and then a cocktail. That is my story and I am sticking with it! Patti said, I don't remember or I was asleep, (a good excuse), and she said she was not sleeping with that other twit so! Each morning we would have a good breakfast and off to the slopes to ski all day and at times, stop at noon for a wine or cocktail. Ah, the good old days. One time we even went to the local Ski Shop and tried various skis and boots and were deciding how much to pay. Eventually we decided just to rent instead of spending a lot of money and then having to store the skis over the summer. 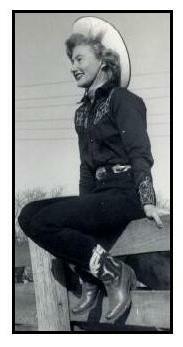 Patti said: We rented equipment at Don's Sporting Goods on Geary St., but bought boots after the 1st season. Later I bought all the equipment. 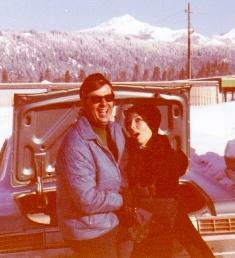 We continued to ski Lassen until winter '72-'73 when Barry and I bought the 3bd/2ba mobile home in Truckee. Our adventures continued. You and Barry shoveled the roof after our 9 hour trip to get there. The picture of you in the white T-shirt is at Sugar Bowl. From Truckee we skied on Saturdays at Alpine Meadows or Squaw Valley and Boreal on Sat. nights. On Sunday we skied Sugar Bowl (remember taking the tram ride? into the village) because it was right on Highway 80. 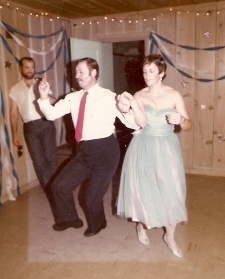 1975 ~ Party Time in the City! During these years, every weekend was a party. We drank, danced and did what ever we could from Friday night until Sunday night and everything was wide open. Everyone partied. We would open the bars at six AM and drink and play dice and gossip and then dance by the jute box. We would do this all day and night but would stop to have a nice dinner in the evenings with before dinner drinks, martinis, wine with dinner, desert drinks such as Black or White Russians after, then back to dance and drink some more. Then at two AM the after hours places would open and off we would go to watch entertainers do drag shows and listen to musicians and songsters. We would meet actors from the Broadway Plays who would come after the performing in the shows to be entertained and to drink and relax and gossip. One day a bar on Polk Street had a Hawaiian party and the Hawaiian bartender at the Tender Trap in the Tenderloin, called his relatives in Hawaii and had them go out and pick special leaves to make me a lei and also one for a friend of mine with flowers. He said only the chieftains could wear these special leaves so it was very special! They had the leis flown over to the coast and we wore them all day, dancing around the streets and to the bar on Polk Street. Ah, the good old days! 1981 ~ A Condo on Twin Peaks - My Friend Patti Wood found this place for me to buy! After my father passed away, I took the monies willed to me to buy a condominium on Twin Peaks with a view of the entire bay area. I moved there in 1976 and lived there until 1992 when I moved to the 28th floor of the Fox Plaza downtown San Francisco with another spectacular view of the City. On Twin Peaks I needed a car to get around. The view was tremendous but owning a car in the City is exorbitant and one gets parking tickets every time you go shopping. The weather is another factor in moving as it is very foggy and windy on top of Twin Peaks. At this time I was busy driving to Sunnyvale and Silicon Valley working on large projects for Boole & Babage and Sterling Software development. I sometimes worked 12 or more hours, (getting paid for over time so made out like a bandit), and driving over two hours round trip a day. This is why I look so thin in these pictures! I also was dancing five nights a week so I was not only trim but very healthy, if not tired! Ah, to be young again! I was going through some old photos in 2014 and couldn't believe it, I found some photos of my condo taken in 1982! I loved the sofas and the layout of the rooms. I put mirrors on the entire wall of the dining room making the room even seem larger! 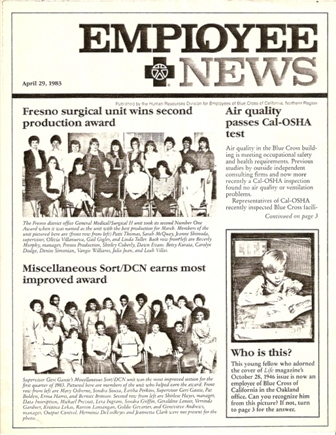 1982 ~ Blue Cross was a Great Place to work at until the new CEO, a friend of Reagon, closed down the Operation in Oakland! After I had become friends with my coworkers at Blue Cross, we had many occasions to party and to celebrate holidays such as Halloween. As you can see by the photo on the left, I liked to dress up and even had cufflinks on my shirt sleeves. I loved that red sports jacket and at times felt bad over the years when the casual dress code came into being. Many dressed like they were at the beach and even one time at Sterling Software near Stanford, one consultant came into the weekly management meeting wearing shorts and flip flops. Excuse me I thought, give me a break. One woman I worked with, Ruth Stellwagon, had parties and invited us over to eat, drink and dance at her new apartment. It was a sock hop and she wore her high school prom dress! There was a group of us that worked as business analysts for Blue Cross and the processing of claims. We designed the forms to be sent to clients, worked with the data entry people on inputting data, worked with personnel from the computer division on setting up programs for use in health care subscriptions to clients. We had many experiences during Halloween. One woman I worked with came in one time dressed as a bumble bee! She had on a yellow and black outfit and on her head were two large antenna! I wasn't going to be so silly and dress up. Well I went down the street a few days before Halloween and saw a store that sold very cheap looking fake fur. Hmmm I said, maybe I could go as Conan the Barbarian! So I bought the fur and made an outfit with a top and covered my cowboy boots with the fur. Not to bad looking for such a short time to make an outfit. Now I wasn't sure what to wear underneath but decided a gold skimpy underwear was perfect. Well Ms. Bumble Bee decided we needed to walk down the street and get lunch. Huh I said. Well why not. So off we went and of course it was no on and everyone was out for lunch. The new building next door was full of lawyers and they happened to be behind us. Ms. Bumble Bee suddenly said, I lost one of my antenna so I bent over and picked it up. Of course my very short barbarian fur coat pulled up and everyone could see my golden undies. One of the lawyers asked the other one, What is going on? He replied, It is just those Blue Cross workers as usual! Blue Cross after that decided maybe it was best if we dressed up to stay inside or just forget about Halloween costumes! We also had a coworker, Jim, (see the photo of us at Fisherman's Wharf), who had an old 1934 or so automobile that looked like something out of a crime movie in the 30s! So we got together and decided we would dress up like mobsters and Jim would drive his car to Oakland and we would drive around trick or treating and in the evening go to Jack London Square by the bay and hit the bars. The women dressed up like gun molls and we certainly were a hit at work and when we drove around town. Talk about good times! 1982 ~ Fireman Fund Friends and a Trip to Fiji and Scuba Diving! My friend Betty and I worked at Fireman's Fund Insurance for years and we and other employees became close friends during the 1970s and 80s an d are still friends after all these years. We not only worked in the computer division but after hours did various fun things along the way. This picture was taken during the Christmas Party of Fireman's Fund at the St. Francis Hotel on Union Square in downtown San Francisco. Betty picked me up in her Cadillac so I felt especially Special as we danced the night away! 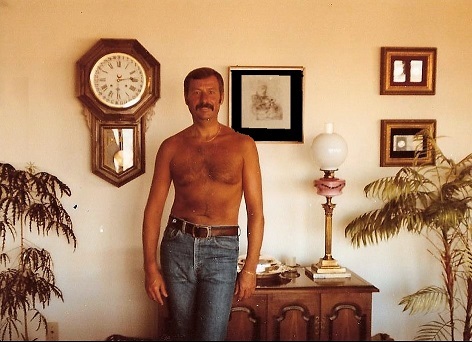 Here I am in 1982 by the entrance to my condominium on Twin Peaks, thin as can be! A group of us used to meet for lunch at work and we all started playing dominoes. It was cut throat and we used to have a great time but I think the rest of the employees thought we had lost it! We took up tap dancing lessons and after a year, our teacher who then was around 80 years old but could tap the feet off of us who were then, only in our 40s! This stopped at Christmas as we heard through the grapevine we were going to put on a 'tap' fund raiser! We didn't think so and the next week we did not showed up for the tap class! Then we proceeded to take cooking lessons and did Italian, Asian, and Greek. We would take a lesson, then prepare the food and have a taste test afterwards. This is a great way to learn how to cook and bake exotic dishes! We also went dancing and out to dinner at different restaurants around the City. This year I was going to Egypt but due to the volatility of the region, my travel agent in Oakland said I shouldn't go! I was very unhappy but she said she had set me up with a new location, in the sand, in the sun and so on. So imagine my surprise when the next week I was in the sand and sun but in Fiji! I had a wonderful time staying on the man island for a week and then on a very small island with only one resort. It was heaven and the snorkeling was unbelievable. I saw huge fruit bats flying over the full moon at midnight and got to fly back to the main airport on a single engine prop plane as you can see by the photo! 1983 ~ Suba Diving Lessons and Trials and Tribulations of Learning! I decided, belatedly it would seem, to take a course in scuba diving. The reason I decided this was the fact that I had first been diving in 1960 in the Bahamas, in Mexico, and Hawaii without any training. Little did I know how little I knew and how much I needed the class. It was held at the YMCA in San Francisco in the Olympic pool in the basement. I had to fight him and drag him from one end of the pool to the other! When we got to the other end the instructor said I had done a great job. I told the women, they could have this man as a partner anytime they wanted to trade! They all laughed and said, "Too bad, but he is yours now!" So I had to drag this hunk through our drills and everyone thought it was funny except me! We dove off the coast near Russian River, north of the City and by the piers in Carmel where we spent a weekend diving and eating! I did get my certificate as you can see and used it in Fiji and other locations around the world! While I was working at Blue Cross someone found out I was on the cover of Life Magazine when I was six years old. They asked me if the company could put my photo on the monthly Blue Cross letter. I, of course, said Yes! They set up a contest to see if anyone could recognize me almost 40 years later as I was 43 at the time. 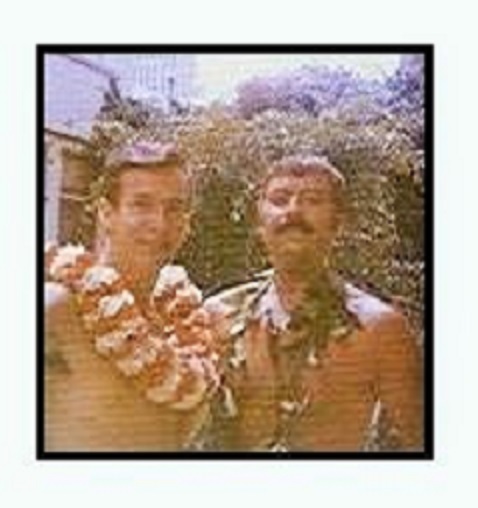 As you can see in the Employee News letter they had my photo from Life Magazine and the eternal question, Who is this? Everyone kept guessing and one day suddenly, a woman came flying over to the 18th floor where I worked as a business analyst. She grabbed me and said she couldn't believe it was me! I asked if I knew her and everyone wondered what was up. She said she was in second grade in of all place - 1946 - Hawaii! She said they had a big discussion about me living on a farm in the states and what the school was like. She then said something that was very funny! She said she and her classmates looked at the photos and for some reason since they were in black and white, the states didn't have green grass or trees, just dark colors. Later her parents brought her to the states and she said she was so surprised, there actually were greens and other colors. Everyone in the business unit had a good laugh about that and of course, she won the prize for knowing the boy on the cover of Life Magazine. Another interesting story in the life of Chuck! 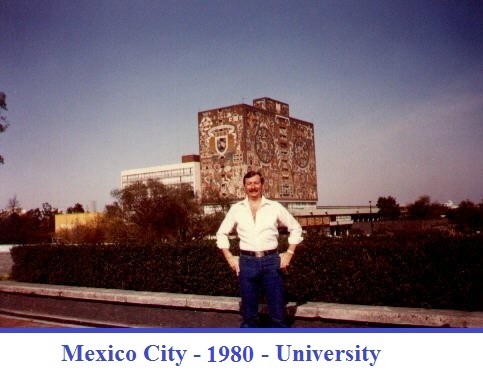 1984 ~ Traveling to Mexico for the fifth time and Finally Cancun and Chichen Itza in 1987! I actually have been to Mexico about four five times or more and visited Tijuana, Nogales, Mazatl'an, Puerto Vallarta, Mexico City, Cancun, M'erida and San Felipe - Baja. This has been from 1970 through 1987. I spent a week in Mexico City in 1984 visiting the museums, palaces and the famous Pyramid of the Sun and Moon outside the city. I met a woman from England who was traveling around the world. She said she had just been to Egypt and saw Kufu's pyramid and the Pyramid of the Sun probably would be small. We decided to hire a cab and took a drive to the pyramids. As we crested the hill and saw the large pyramid she said, "Crap, this is much bigger than I thought it would be!" We had a good laugh. At that stage I hadn't been to Egypt so I couldn't make a comparison. We did climb to the top, I made it but she decided two thirds of the way up, to sit and enjoy the view! 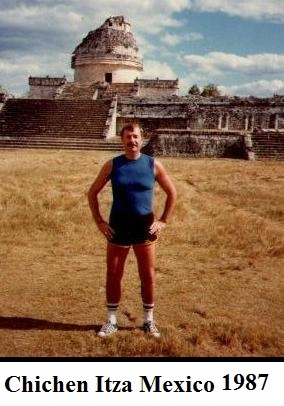 My very favorite spot was Chichen Itza in the Yucatan Peninsula in 1987. The ruins are fantastic but are weathering very badly due to the acid rain. I also spent time in M'erida, and actually celebrated Christmas services in the local cathedral! On this trip I also drove to Tulum on the Atlantic coast just south of Cancun. Beautiful water and views and beaches. 1984 ~ I became a Press Correspondant for a Radio Station Covering Current Events in my Spare Time! When I was working at Blue Cross as a business analyst in Oakland, I became friends with Tim. One day he asked me if I would like to work part time for him during my off hours as a business analyst at Blue Cross as a radio announcer and reporter! I was surprised, as I didn't know he had anything to do with the radio or reporting. He said I would get a press pass and attend private movie showings before anyone else and I would review them and give a two or three minute expose about them on the air! I would also do previews of the latest books in the market along with interviewing notable people in the area. He said his operation was just a one-man operation but had affiliates in London and surrounding areas, New York area and Australia! He would tape the reviews or interviews on a weekly basis and send to the affiliates around the world. I was amazed and asked, "Why me?" He said I was good at talking to people and also had a good speaking voice and would sound good on the radio. Well who am I to discourage someone who said that about me! I, of course, said, "Yes!" So suddenly I was a reporter with press credentials and started to go to private movie showings in the evenings. It was interesting as most people never knew some of the office buildings in San Francisco had private screening rooms with huge individual cushioned seats to watch the movies along with a glass of wine! I also reviewed the latest books and our biggest splash was the first time the "Gay Parade" had been presented on the radio. We started at five AM and worked until after eight PM. We ran all over interviewing people and our biggest catch was on the podium in front of city hall. There was our Senator giving a speech and Tim and I grabbed him after his speech and he was kind enough to give us an interview. His wife thought the entire parade and interview were good for a laugh and said they had a wonderful time watching the parade and meeting so many nice people. This show was very popular in London and Australia! Tim said he did get some comments from the affiliates as to who was that 'man' with the deep commanding voice! We had a good laugh about that! Tim decided after several years that the time and money needed to maintain a private radio commentary was too high to continue! So my career as a radio personality was over! When the Blue Cross offices were closed in Oakland and moved to Woodland Hills, I began to do consulting. My first contract was at Boole and Babbage, a software company in Sunnyvale. In the mean time, Tim had inherited some money after his mother had passed away and he bought a 65 foot yacht! Oh, baby, was it nice! The photo shows us having lunch at Fisherman's Wharf in San Francisco. Tim had sailed his yacht into the harbor and after lunch, we and several other friends that we had worked with at Blue Cross, cruised around the bay acting like we were millionaires. We had a great time. About a year later Tim contacted me as he was doing some work at a nearby company in Sunnyvale and said we should get together for lunch sometime to talk over old times. We were around 45 years old then. I was excited to see him again but thought it was strange as I never heard from him after that phone call. Then one day I saw someone in San Francisco who had worked with us at Blue Cross and he said Tim had suddenly passed away! I was shocked needless to say as he was only in his late 40s! So I was glad he did get to buy his yacht as that was something he always wanted to have before he died but little did I realize he would be gone so soon. At least I have a nice photo of him and some great memories to put down for posterity and my several years as a radio reporter and interviewer! 1985 ~ Blue Cross was Famous for it's Halloween Parties! This year we had a lot of fun as each year Blue Cross let people dress up in costumes and come to work. One year I dressed up like a cave man an d one woman dressed up like a honey bee! We left at noon to go to lunch and two business men were behind us and one said to the other, there go those Blue Cross workers! Excuse me! The next year a bunch of us were talking about dressing up and one of the guys, Tim, said he had a 1930's car that looked just like a mafia car or one from the 1930's movies about evil gangsters and their molls! So the men dressed up in suits with cigarettes and cigars hanging off their lips and the gals dressed up like molls. Tim drove the car to work and we met him down the street and arrived at work in the car and got out causing a stir. I am in the center and Tim is on the right. After work we drove around and ended up at the wharf in Oakland and proceeded to have cocktails and we created quite a scene. Ah, the good old days! 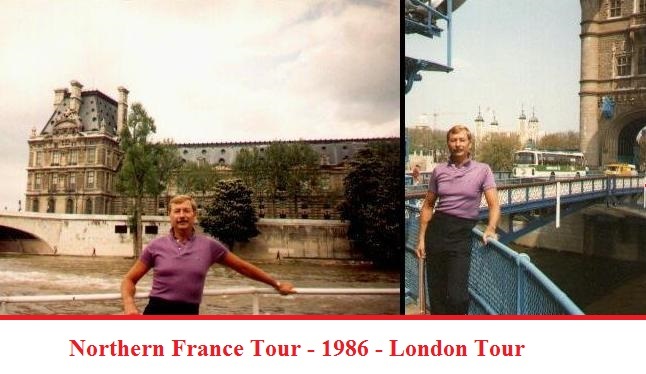 1986 ~ One week in London and two weeks in France! This happy group worked at Blue Cross in the 1980s until one of Reagan's henchmen came to take over as the president of our non-profit company. He lied and said jobs were safe and within six months, moved the computer operations to Southern California and dumped all most all of the staff, over a 1,000 people. Anyway, here we are at the local bar/restaurant having a great time since there were so many Aquarians in our department with the exception of one, Bob! It was humorous as the bar was 'gay' but had good food so everyone went there for lunch. Only in California! Here is a list of the people with Aquarian birthdays! I decided to go to France but my travel agent said as long as I was going that far, just fly to England and visit London for five days, the take the hover craft over to Cala and then on to France to tour Paris and the Loire Valley countryside. 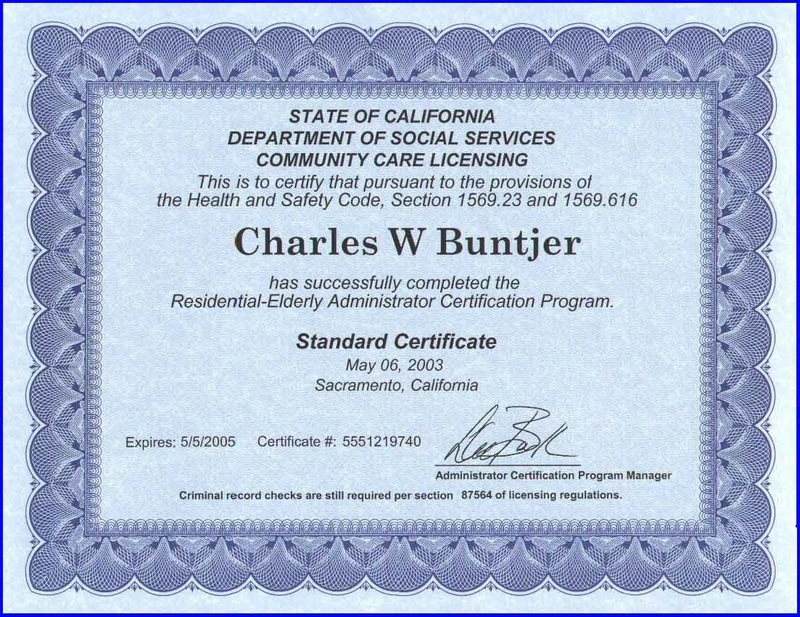 1987 ~ Between Consulting Contracts - A class to obtain a Realtor's License! When I was between contracts I would take classes in case another job was not in the wings! One time I took a course on scuba diving at the YMCA which covered diving and safety procedures. 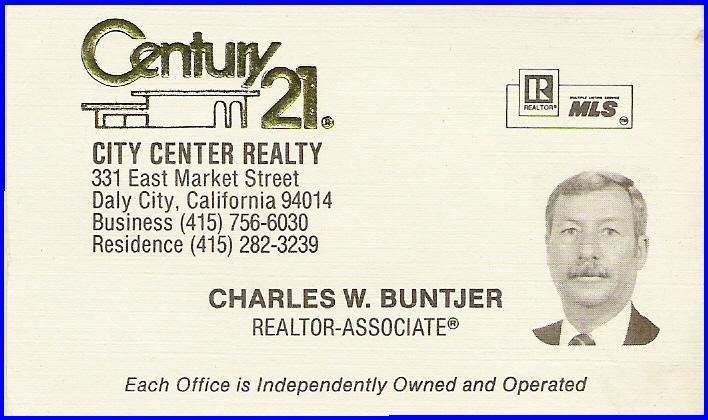 But this class was a realtor's class taken in Daly City in 1987 with Century 21. I went three times a week for three weeks. Then I took a weekend course that guaranteed you would pass the California state test or you would get your $100 back! Not a bad deal. After the weekend course, they stipulated one should answer the questions and not stop until finished. Do not go back and reread as most people would do, then start to change answers and fail the test. This was a valuable lesson for me as I found when taking other state tests such as the Certificate to become a Senior Residence Manager! There must have been over 150 people taking the three hour test. I finished in 45 minutes and took my papers to the tester and she said to leave my papers and when finished doing what ever, to come back to finish the test. Everyone looked at me as I said, "I am finished!" Gasps from everyone. But I just left as I had looked at the first question and thought it was wrong, then the next one! No, I said, just forget it and leave. Six weeks later I got my notification I had my realtors license. I then was representing owners of a house on Twin Peaks, asking price, $800,000.00. And this was in 1987! Well as I was presenting the house and had a perspective buyer, a contract came up for me, a year long and probably worth at least $80,000 a year so I had to make up my mind. Stay in the realty business or continue with the contracting. I decided to stay with the computer industry which was a good deal as I made out during the 1990s and the dot-com era! 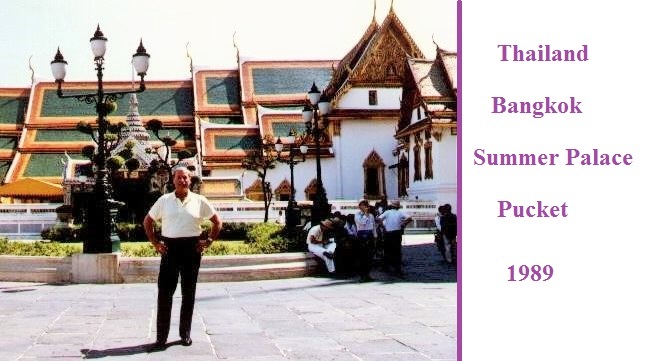 1989 ~ Consulting at Boole & Babbage, the Earthquake and on to Thailand! I was consulting at Boole & Baggage Software Corporation near San Jose and had just setup my trip to Thailand . Imagine my surprise when I was working late finishing a major project before leaving, when the big earthquake hit. There wasn't anyone there and I thought, great, we haven't had a good quake in a long time. Ha.... The building shook and swayed and I thought this is not fun! I stood against the wall while the building shook and then the lights went out for about ten minutes. They came back on and I figured I might as well keep working on the project. I decided to leave around 11 P.M. and was stopped by the police. Imagine my surprise when told the roads were down from collapsed bridges! So I went back to work, finished the project and drove home the next day. My condo on Twin Peaks was fine but I was worried as the airport had been closed down. I went to a local store for some traveling clothes and there was a T-Shirt salesman with a shirt that had printed on it, "I Survived the 6.8 Earthquake of San Francisco!" I had to laugh, the second day and a shirt out all ready. I bought it and fly to Thailand the next day. I came down for breakfast in Bangkok and wore the shirt. People were reading the London Times and so on, the papers said San Francisco was in ruins and here I am with this shirt and the message. People couldn't believe it and I said the City had not burned down and most of it was just fine. 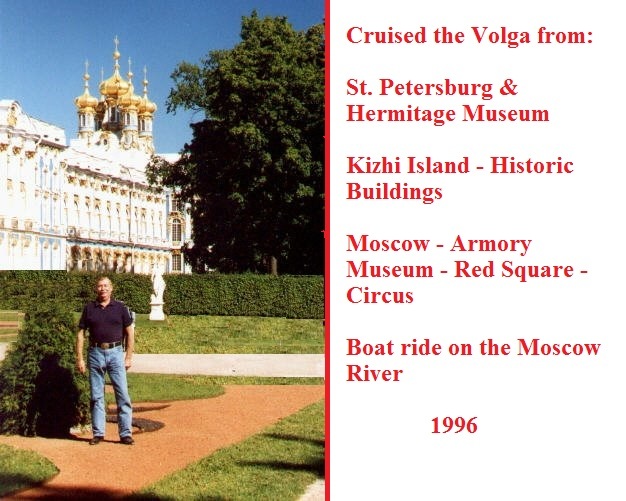 I didn't have anything planned but was picked up by a woman travel guide and she happened not to have a tour group so I hired her and her driver for a week for about $200.00. Such a deal. We drove all over the area around Bangkok and then took a boat ride to the Summer Palace. I then flew to Pucket, located off of the Andaman Sea. I had a great time boating all over the islands. A great vacation as usual! 1990s ~ Consulting at Major Corporations! Here is my personal name plate to place on my desk where ever I was hired to consult on IT projects. This agency was my favorite one that I worked for. 1991 ~ Dancing with the Stars - West Coast Swing Exhibitions! 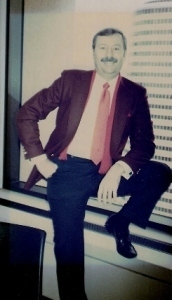 When I was in college at Rockford College in 1959, I went to Arthur Murray's Dance Studio and asked if they would teach me to dance and become a teacher at night for pay. I figured being on the farm and not really knowing how to dance, getting a good background in dance would be good for my social life and in the business world. Of course I am sure my family thought, there he goes again! Little did I know 30 years later I would be dancing and teaching classes in San Francisco in my spare time while doing consulting on software development. Well the owner of the studio in Rockford Illinois said I could take lessons to become a teacher and not get paid! Huh! I said excuse me, I expect to be paid one way or another. Get this, the owner thought if I was so up front and pushy, I would be good as a teacher and sales rep for selling dance courses. I was the only one who was paid for three months while learning to dance. You can't beat that! After a few months of teaching the guys were all after this tall dark haired gorgeous dance teacher who had been working there for a while. One evening while we were all sitting in the coffee room she ran in and hugged me and gave me a big kiss. Well everyone wondered what was up with Nancy. She told me she had been in school with me at the one room school in Pecatonica, she was in the seventh grade and I was in first grade! I vaguely remembered her and she told me she had a boy friend (she sounded like she was a gun mol l as far as I was concerned), and was moving to Los Angeles and she wanted to talk to me before she gave notice and left for the West Coast. Well I was unhappy, she was getting out of town and going to Los Angeles and here I was - stuck in Illinois. Well little did I know within five years I would be on the West Coast in San Francisco! I eventually would be flying to Los Angeles and Beverly Hills on a regular schedule for several years while working part time for my friend Viviane in her Senior Residence in Woodland Hills plus visiting just for fun. I always wondered what happened to Nancy - could she still be there? Here in the City I started to take West Coast Swing lessons. It is very difficult and combines swing and almost has a Cha Cha feel to it. I believe it was developed during the 1940's in Los Angeles during the War Years. The dance floors would be so crowded that the leader stayed in one spot and the partner would be spun around him on a more or less straight line - or back and forth. I met a partner who was about five foot five and 100 pounds so I could do almost anything with him! 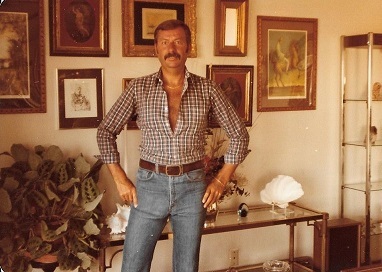 I used to drive from Sunnyvale after work to the local bar and dance until almost eight P.M. The bar had free dance lessons during the week nights and many times they would let us dance on the huge dance floor alone for up to two hours as people really liked to see us dance. We did western and ballroom but mainly West Coast Swing and that irritated many purists as they said this wasn't really western dancing. We decided having the word West in it was enough reason to dance it. I also taught at a local dance bar on upper Market Street called the Corral! It was mostly western and I also taught line dances and west coast swing! I also danced nightly at the Rawhide during the week, a dance bar south of market for over ten years. I was working in Silicon Valley, consulting at major corporations and would drive back to the City and meet my dance partner and dance from about 6:00 P.M. until the free dance classes started at 7:30 P.M. We were so good that many times we dance alone on the floor, doing west coast swing and the two step but with lots of turns which infuriated the so called purists. If in Texas, one just flew around the floor on the two step, no fancy turns for those butch numbers. But guess what, many times 60 or more people would just stand and watch us and some nights we danced into the actual class time! 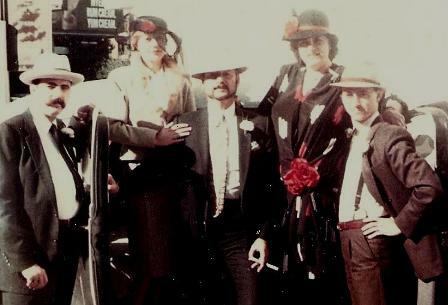 The Black & White Ball is one of the biggest events in San Francisco and I attended it in the 1990s with a dance partner from a dance bar called the Rawhide. The Black & White Ball is held every two years and is very expensive but worth the price. Everyone wears black and white and diamonds or what ever one can afford. The entire Civic Center is closed off and bands play in the Symphony Hall, the Opera House, the State Office Buildings, the Marines Memorial Building (Where the United Nations Charter was signed), the City Hall and also in many tents set up around the streets. Thousands of people attend and drink champagne and eat great food and dance the night away until early in the morning. Then it is time to go home and rest up for the next Black & White Ball! 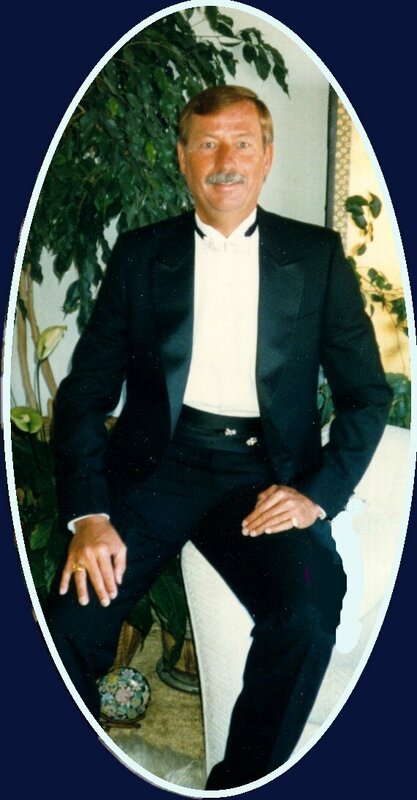 Here am I looking spiffy in my tuxedo and some rhinestone jewelry. I joined a dance group, Partners For Peace, in the late 1980s while I was dancing at the local bars in the City. The group, Partner's For Peace was a lot of fun and we had about ten people in the group. We danced different places around the City and one of our nicest was an Aids benefit in the Marine's Ballroom on the top floor of a building in the downtown area. Two women made copies of our dancing at a benefit in Olives in 1991, a bar restaurant near the San Francisco Bay. Unfortunately they forgot to bring the lights so the movie is rather dark but still one can see we didn't look too bad for amateurs. I had a friend cut out the portion of my west coast dance and it lasts about three minutes! When I look at it I can't believe I knew so many steps in the dance. I uploaded the video to Google and my dance number may be viewed by clicking on the following link. 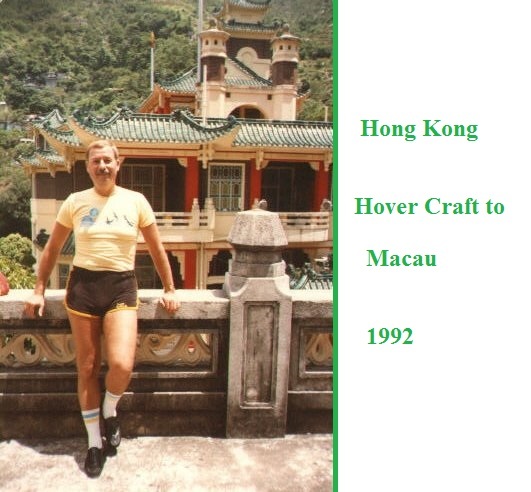 1992 ~ Hong Kong - Athens in Greece and a trip all over Egypt! 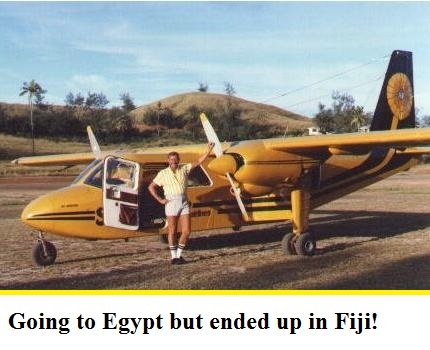 I decided in 1992 to start traveling the world as much as possible before I was too old to get around with out any help! Time flies! By this time I was consulting for many of the major corporations in the bay area. This year I was working at Sterling Software near Sunnyvale helping to design a backup and recovery service for mainframe computer systems. Well this year I saw an advertisement about a special to Hong Kong! Airfare and hotel room and a day tour of Victoria Island for $999.00. Such a deal. Of course I went for a week and it was during the time the British were negotiating with China over the turnover of Hong Kong to China. Every morning I had breakfast on the top floor overlooking Hong Kong, a fantastic buffet that was included in the trip. We were given the London Times to read and keep up with the local news and the negotiations. Hong Kong was easy to get around in, walking on the main boulevard or taking the ferry over to Victoria Island was easy and inexpensive. I met some people who were in the know and they took me to the in place in Hong Kong, a fabulous dance hall with lots of action. The weather was superb, only about 80 degrees. I also did a tour of Macau before it was returned to China. Macau is famous for gambling casinos that see a lot of action from the women during the day who live in Hong Kong. The day we visited and were having lunch, a huge rain storm hit the island and a man from India said it was just like a monsoon! Clouds were very strange and yellowish and greenish! The ride back on a hover craft was very rough and the waves shot over the bow but we arrived safe and sound. A great trip for a great price! This year I finally did get to Egypt on a great tour. There were only about 24 of us and the country was still dangerous so there weren't many people visiting Egypt. We had trouble getting to Egypt via Athens and Olympic Airlines. You can read all about that horrible experience on my flight to Greece on the web pages of Egypt or the Greek home web pages. Because of all the trouble Olympic Airlines gave us flying to Greece and on to Egypt, we were given a day in Greece with a hotel and a cab driver who took us all over the city. So we had an extra country to count on this trip! I moved from Twin Peaks in the fall of 1993 to the Civic Center. I rented a studio on the 28th floor. I never expected to live there that long but as of 2015, I have been here over 22 years. A good thing as the building is on rent control. I was checking my files and found the original Fox Plaza Lease I signed in 1993! Now studios around the area are costing up to $3,000.00 a month because of all the high tech workers moving into the City. Across the street from Fox Plaza is Twitter, Dolby Labs, Yammer and Square! My one bed room would probably rent right now for over $4,500.00 a month but with rent control, I am paying less than $1,500.00 a month! Plus parking is around $300.00 a month if you need to park a car in the building. Another plus is all the busses stop in front of the building, the subway system, BART, is a block away plus City Hall, the Symphony, the Opera/Ballet, Herbst Theatre and the Asian Art Musuem all within two blocks from here! 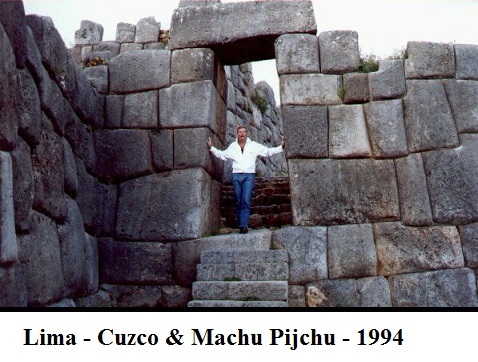 1994 ~ One of the Wonders of the World - Machu Pijchu in Peru! This year I was consulting at IBM on an outpatient booking system for Kaiser Permanente. Of course I always wanted to go to see Machu Pijchu in Peru and finally realized my dream. First I flew to Los Angeles and then to Lima. There I spent five days touring and walking around the city and the coast. Then I flew to Cusco and toured the city and then took the train to the ruins. At this time the hotel that overlooked the ruins only had about 18 rooms in it and only four rooms had people in them for an overnight stay. There were six of us and three of the people had altitude sickness and never came out. A couple from back east were there and we had a great time together. Hard to believe but the next day the train had a problem and didn't make it back so we had an entire day to tour the ruins, just three of us. I actually climbed the other peak next to Machu Pijchu (this is the spelling on the brochures at the ruins!). This is very dangerous but worth while if you have the nerve. After this excursion, I flew back to Lima and on to Iquitos Peru for a few days and then into Brazil for an Amazon Cruise! 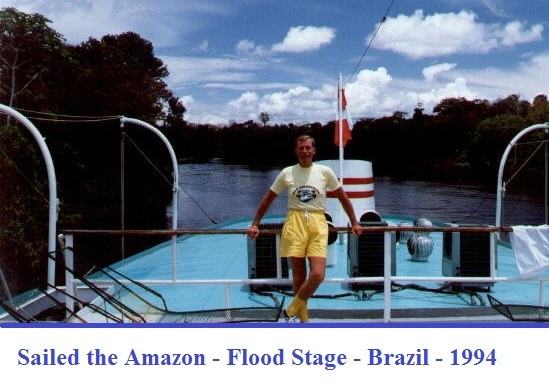 1994 ~ Fantastic Amazon Cruise from Brazil into Peru - Flood Stage of the Amazon! After visiting the ruins of Machu Pijchu, I flew back to Lima and then into Iquitos on the Amazon River near the Brazil border. We flew on a small jet into Tabatinga Brazil and there we were taken by taxi to Leticia Colombia and then by dugout canoes to the boat that looked like something out of an old movie! There were about 80 people an the ship and all were very friendly. The guides were nice and helpful. The captain said this was the first time in 30 years there weren't any bugs or mosquitoes bothering people when the ship docked in the evening. We were able to have cocktails on the outdoor deck and also our evening dinner. All very nice. Late at night we would take the launches and go into the foliage and look for the local crocodiles. We also so the huge lily pads that are about 12 feet across and were told we were lucky to see them as they get big during the flood stage. The river was 2,500 miles from the Atlantic but it looked like a huge lake as sometimes we couldn't see the shore. We stopped at local villages and saw them making canoes out of huge logs by chipping out the centers. We also saw bark cloth and other means of living off the jungle. All in all, a great trip and great weather! 1995 ~ My Brother-in-law Told Me to Sign up for VA Health Care! I have photos of the VA Hospital in San Francisco where I have my health care and pictures of the fantastic views from the hospital including the Golden Gate Bridge and the Pacific Ocean! I had lost my health insurance during some of my consulting as health care insurance isn't provided to self employed workers. Ken Burt, my favorite brother-in-law said I needed to apply to the VA Hospital to get health insurance. Well it was one of the best things anyone could have told me. I now have had health care for many years and most everything is paid for. I also go to a Dental School and most of the dental care is free also. I had consulted at Blue Cross at one time and asked them around 2000 what it would cost me as a single man living in the City. They said around $600.00 a month! I don't think so! This year I was consulting at Deltanet in the San Francisco Financial Center. I decided to go to Russia and take a river tour from St. Petersburg to Moscow through around 18 locks. The river is only open for the summer months and the rest of the time it is frozen over and the towns are basically cut off from the rest of the country. Good thing there is television and hopefully internet by now. We toured St. Petersburg and were lucky as the weather was about 80 degrees, the best weather they said they had had in years! We went to Petrodvorets - Peter the Greats Summer Palace on the Gulf of Finland. Next the palace of Catherine the Great, here I am in front of the palace. We toured the Hermitage and even went to a dress up ballet exhibition at the private theatre that seated perhaps 250 or so. The river tour was great and we saw lots of interesting old wooden buildings and summer dachas that the town people vacationed in during the warm season. We also saw the Kizhi Island - a completely wooden Transfiguration Church built in 1714. We finally made Moscow and the Moscow Circus, the Ballet, the Armory Museum, Red Square and so on. Four of us left the ship and went to the subway system and toured the city and ended up taking an afternoon tour on the river. Everyone else was jealous that we took things into our own hands and toured the city on our own! This year I was consulting at William-Sonoma and I worked with programmers to document AS400 programs for updating applications to fit the user's needs. I always wanted to go to China and see the Three Gorges, the Terracotta Warriors and the Great Wall and I finally made it! I flew into Shanghai and we toured the city and then flew to Wuhan and our boat the "Beidou" at the junction of the Yangtze and the Han River. We saw the beginning of the super dam being built on the Yangtze Ricer and then took small boats into the side gorges for great views of things that will disappear under the rising waters behind the dam. We ended up after hundreds of miles of visiting beautiful temples and villages and then to Chongqing, the next big city to rival perhaps Shanghai as the terminus of the huge lake behind the dam. 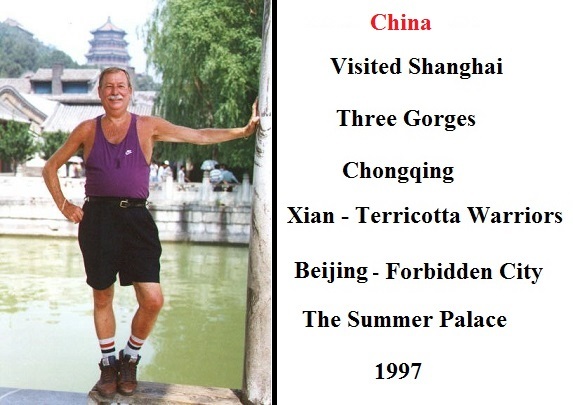 We toured this city and then flew to Xian and the Terracotta Warriors. This was a great experience but it was very hot and smoggy. Then to Beijing and a tour of the Forbidden City, a trip north to the Summer Palace and finally a tour of the Great Wall of China. The last few days in Beijing were exciting but the air pollution was terrible and probably will get worse with them burning soft coal for energy. Still, the people were friendly and helpful and there was plenty of food and great tasting. All in all, a very nice trip to an interesting country. 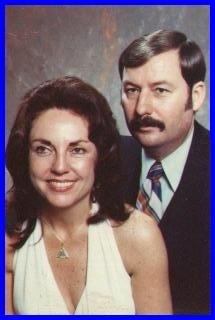 I met Betty in the 1970s at Fireman's Fund Insurance and we became good friends then. We did a lot of things together with other employees at the company. Patti, Betty and I took cooking classes one year. Every week we would go to a person's house and the woman would teach us a specific type of cooking such as Italian, Japanese, and so on. After we listened to a lecture and then helped prep and prepare the meals, we all sat down and had an enjoyable meal! We also took tap dancing classes with two sisters who were around 80 years old. The one couldn't do much tapping but the other one was thin and wiry and could tap anyone under the table. Well we did an entire summer of tap lessons and one evening we came in the the tap teacher told us Christmas was coming up and they always had a tap dancing extravaganza at a local school or for a benefit. We informed the teacher that we had never been asked about this and..... we never showed up for another tap lesson. Our big chance for a tap dancing career went out the window! For a long time we played dominoes at our lunch hour at Fireman's Fund Insurance and there we met another person who would become a friend, Jim Fera. He and his partner Ben now live in Southern California and I visited them in 2004 with my sister. The photo on the left was taken at Betty's 70th birthday and I was a surprise visitor. 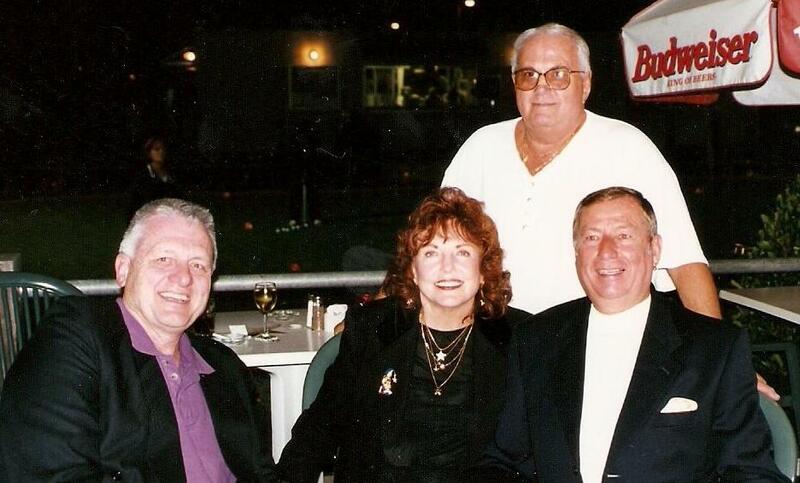 The photo on the right has Ben, Betty, Jim and myself looking very spiffy! 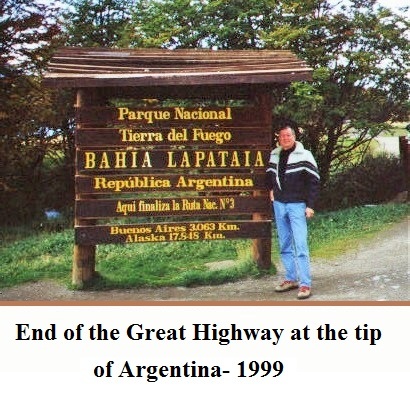 1999 ~ Cruise through Tierra del Fuego - Chile and Argentina - Patagonia! T his was a big contract at Banc of America Securities in San Francisco. I set up testing standards for the Year 2000 program changes and documented the test scripts for nine systems in the Montgomery Securities BackOffice Division. Assumed testing lead over three teams to coordinate and ensure the base line testing was follow ed correctly. Documented results from the base line testing and used the results to set up the testing criteria for Y2K production testing for each test script. Tested systems against the current production environment and against the production environment with the Y2K program changes in place to determine if the results were the same. Finally tested the systems against the Y2K program changes with aged data to ensure all of the Y2K program changes match the test criteria. Results are reviewed and reliability determined by the auditors and the SEC for final approval of the Y2K testing for the first phase of reconfiguration of the Y2K interactive program changes. So I decided I needed a really big trip! This trip was composed of Chile and Argentina and the Patagonian Park plus an island of penguins. I flew to Los Angeles, then to Lima Peru, then to Santiago, then to Punta Mont and then on to Punta Arenas. The adventure started on the M/V Terra Autralis cruise ship that only carries 114 passengers and we started our seven day journey with a welcome dinner and introduction to the crew, then castoff to cruise through the Tierra del Fuego islands which included the Strait of Magellan and the Beagle Channel around the island of Tierra del Fuego. We visited the Agostini Fjord where we could take pictures of the Serrano glacier that dislodges from the Darwin Mountain Range. We docked in Argentina at the remote city of Ushuaia where there again were several alternatives in visiting the area. We decided to take the train and visit the Tierra del Fuego Park in Argentina. The entire trip was a great experience but then I flew back to Santiago for a few days and then flew to Easter Island for a week! 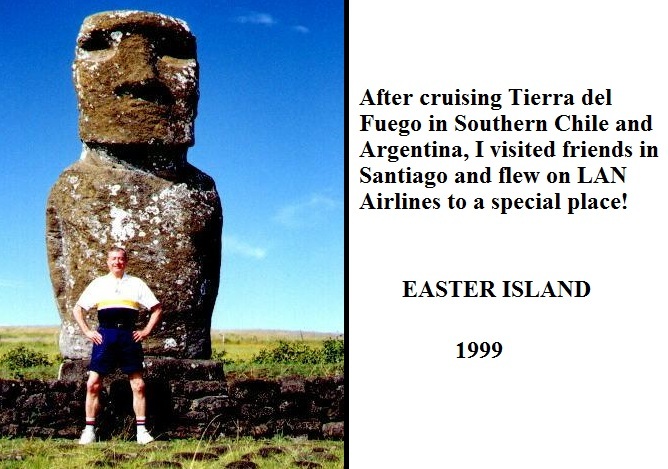 I figured as long as I was in Santiago and so close, 2,000 miles, I might as well go to Easter Island ! I didn't realize that Patricia and Bill who are from Glasgow, were on the same flight from Santiago, they had been on the Tierra del Fuego cruise also. They had heard I was going to Easter Island and also that I was staying at the Hotel Okai and wanted to surprise me there. As fate would have it, their Lan Chile airline seats were right behind me, we all were surprised! Our hotel is situated in Hanga Roa which is the only town on Easter Island. Most of the 2,000 Rapanui people that live on the island reside here. The only port on the island is situated here, as is Cook's Bay, where Captain Cook anchored his boat just offshore in 1722. Easter Island is over 2,000 miles from the nearest population center, (Tahiti and Chile), making it one of the most isolated places on Earth. Easter Island today, remains one of the most unique places you will ever encounter; an open air museum showcasing a fascinating, but unfortunately lost, culture. The Rapanui are among the friendliest people you will ever meet, and the landscape is truly amazing - with its volcanic craters, lava formations, beaches, brilliant blue water, and archaeological sites. We visited two of the craters on the island that contain fresh water and native plants, about the only place there are any left! I had a great time and one week is enough time to see everything and just relax at the local restaurants and cocktail lounges! 1999/2000 ~ Millennium New Year in Vienna and Budapest! Viviane, whom I met on the trip in the spring of 1999 to Chile and Argentina and she had planned a millennium trip to Vienna Austria with a side trip perhaps, to Budapest Hungary ! She hadn't found anyone to go with so she called me by chance. "Would you like to go to Vienna for the Millennium New Year?" she asked. "Yes!" was my instant answer as I was consulting on the Y2K fix for Banc of America Securities and wanted to get away for a few weeks. I think she was surprised at my quick response! So we currently have our airline tickets on Air France to fly to Paris where we will change planes and fly on to Vienna where we also have made hotel reservations in the heart of the city, five minutes away from all the sights at the Pension Shermin! We saw the famous Freyung Passage (covered gallery kind of like in Milan) and then lunch at cafe in Herrengasse (more goulash soup). We walked through the Ring Street gallery, Vienna’s version of the shopping mall and dinner at the Schwarzenberg Cafe with a no smoking area, hurray! Checked out arts and crafts fair at Karlskirche (Charles Church) and time to get dressed for New Year’s Eve, all dressed up and a lot of places to go and be seen! Started at City Hall (Rathaus) where the stage is set with orchestra and waltz performers and saw many dancing and pushing towards Burgtheater and streets leading to cathedral and then a stop for champagne at the American Bar and another stop for champagne at another bar With 15 minutes to spare, dashed to Karlskirche, grabbed a champagne and toasted the new millennium where we met people around one of the many fire barrels. After the New Year we took a train to Budapest to sight see the town and go to the famous Gellert Hotel and a long needed soak in thermal baths. 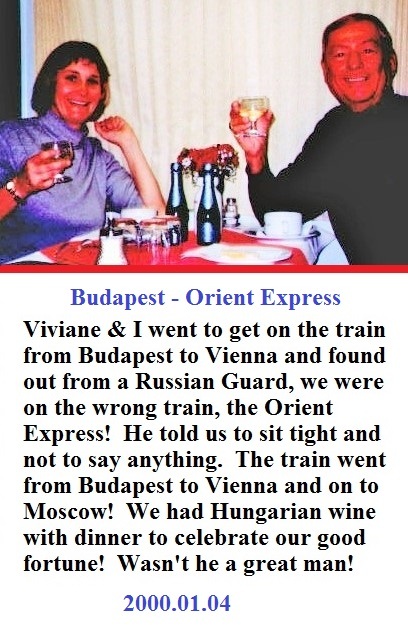 We accidentally got on the wrong train coming back to Vienna, it was the Orient Express! But the military guard saw us sitting in one of the private rooms and he smiled and said not to worry, just stay put like we belonged! So we had dinner and champagne on the Orient Express and arrived back in Vienna feeling just fine! So we had a fabulous time in Vienna and Budapest, what a Millennium New Year! 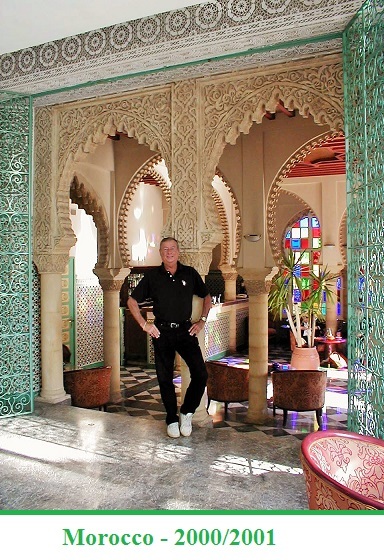 2000 ~ Y2K Fix for Banc of America & my 60th Birthday Celebration and a tour of Morocco! I was working on the Y2K fix with other consultants and employees when I turned 60! The group I worked with were very nice and when they heard I was having my big 60th birthday on February 4th, they decided to throw me a big party at a local bar and restaurant not far from the office. We had drinks before, champagne and wine with dinner, and then more drinks later. The next day quite a few people were late to work for some reason! I of course, being a consultant, was there bright and early! Shortly after my birthday the Y2K fix was in and I left the next month to go to Schwab and work for a director there on several major projects. I also went to Morocco this year for the real Millennium New Year. I went with my friend from Beverly Hills, Viviane. 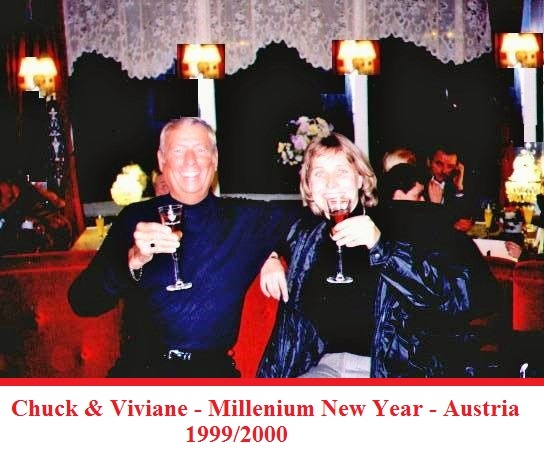 We had such a good time in Vienna and Budapest for the 1999 Millennium New Year we decided to do it again in 2000! We flew from Paris to Casablanca and took the train to the capital, Rabat, and spent a few days there. The took the train to Fez and the famous rug merchants. Then we hired a Mercedes and driver and went over the Atlas Mountains and on to Marrakech for the real Millennium New Year and finally to Casablanca and the world famous mosque, one of the largest in the world. All in all, another great vacation! 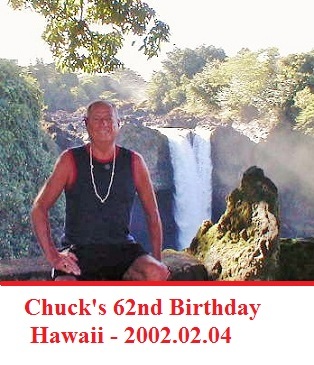 2002 ~ 62nd Birthday on the BIG Island - Hawaii! I decided to go to Honolulu for my 62nd birthday but on the actual day, February 4th, I got up at four AM and flew to the big island, Hawaii, and took an all day tour of the island. We visited the coasts, the volcano, had lunch overlooking the craters, then a walk in the rain forest, a hike through a lava tube and finally a tour through the orchid farms. Back on the plane and arrived in Honolulu and the hotel by ten PM. A long but fulfilling day for my birthday! Check out my Hawaiian trip on the home page menu! And this was the year of my last contract working in the computer industry after over 40 years! Time flies. The last company was Franklin-Templeton Insurance and I worked on security procedures! I decided to retire from the computer industry and travel around the world as can be seen on the Home Page of my web site! 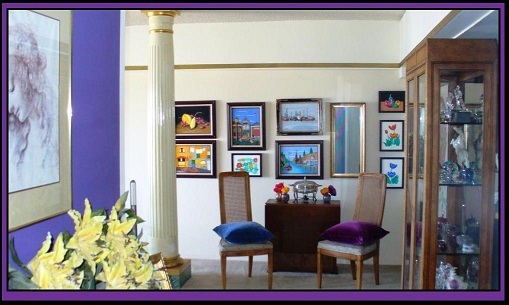 I also am a business partner in a senior residence in Woodland Hills, California with my friend Viviane. We met on a trip in 1999 on a cruise through the Magellan Straits in Tierra del Fuego, South America. 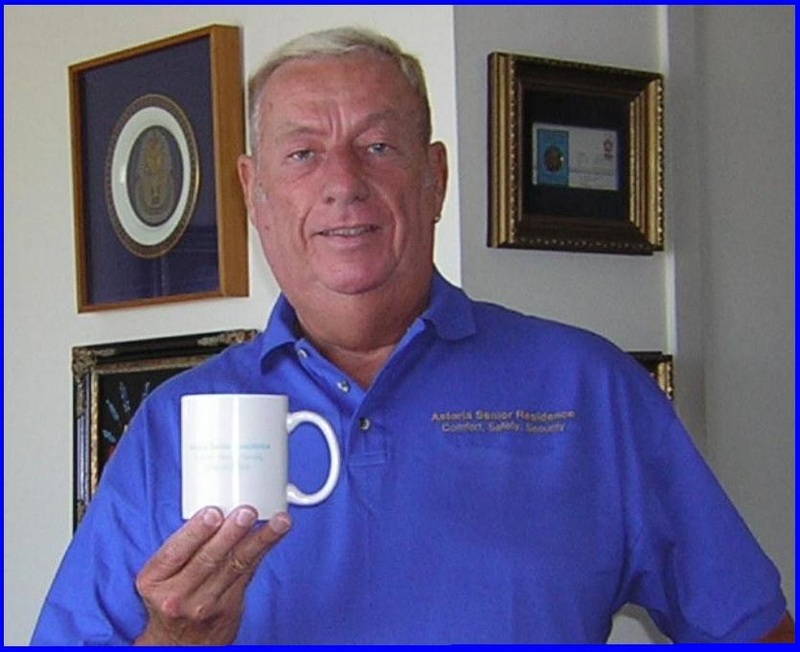 In this picture I am wearing a shirt and I am holding a cup with the Astoria Senior Residence name printed in gold on a blue background. Our advertising budget for the year! I had to take a California State test to have a license as a care giver manager for a facility and I work part time in running the business which means frequent flights to LAX or the Burbank Airport. I am also active at the local YMCA and serve on various committees and I am associated with several of the local museums. 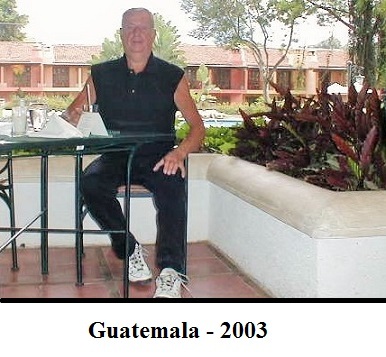 This year I traveled to Guatemala as you can see in this photo taken in Antiqua! I took up oil painting of landscapes and still life in 2003 and these are for sale and may be seen on the link on my Home Page. 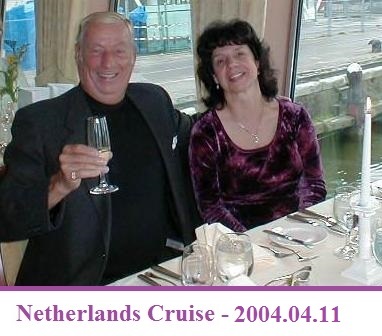 2004 ~ Cruising the Netherlands and a Two Week tour of Turkey! Well I have been living in San Francisco for over 42 years and decided to take two trips this year! My first trip was to the Netherlands ! in the spring with my friend Gail from Van Nuys Los Angeles. We took a Uniworld Cruise and had dinner at the Captains table on the last night of the trip. Everyone was very jealous! As you can see, we enjoyed a lot of champagne at our favorite table on the Cruise! Our waiter made sure we always got the best spot! Gail and I also traveled to Zambia and South Africa! And on the right, a photo of me in Turkey in November of 2004. This was a great trip as I made two new friends. Jeff works only two blocks from me and we go to many Broadway Plays in the City. I also met Barbara and since this trip, we have taken several others including Vietnam and Cambodia. As you can see, semi-retirement is certainly a good life as far as I am concerned! 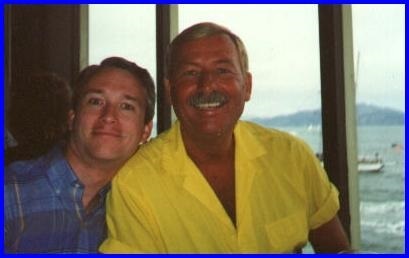 2005 ~ Driving 600 miles around Costa Rico! And here I am in front of a fantastic falls near Arenal in Costa Rico . My friend Barbara, whom I met in 2004 on my Turkey trip, and she suggested we fly there and drive over 600 miles around the country. We were caught in Hurricane Stan and had to land in El Salvador and then couldn't take off due to a volcanic eruption! Finally we arrived in Costa Rica and drove to Arenal where that volcano erupted making a fantastic spectacle at night. We drove to the cloud forest in Monteverde and then onto Manuel Antonio to hike through the jungle, swim in the Pacific and finally, do the zip-line through the jungle canopy. All in all, a great trip and another great year in and out of San Francisco! 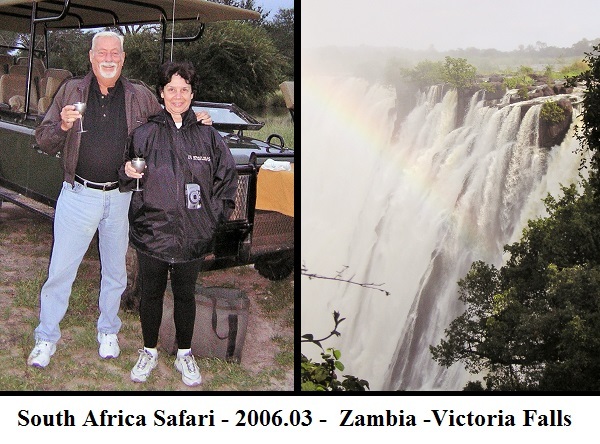 2006 ~ Fantastic Trip to Zambia (Victoria Falls) and South Africa! And this year of March 2006, I went to Zambia and South Africa with my friend Gail.